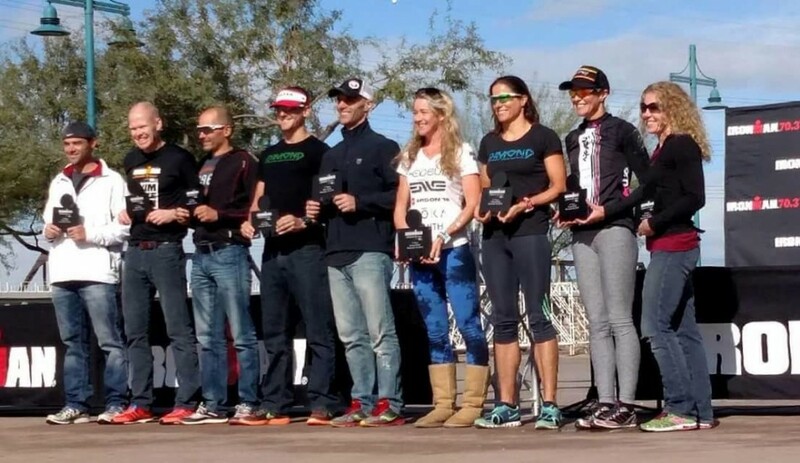 IMAZ was my 2nd race of the 2015 season. Kona was my first race, and I feel IMAZ was a much better day for me, probably because it was cold, and not hot at all. With the exception of the swim I feel that my result reflects my current form (which is ok, not great). I ended up with 9:19 and 2nd in M35-39. 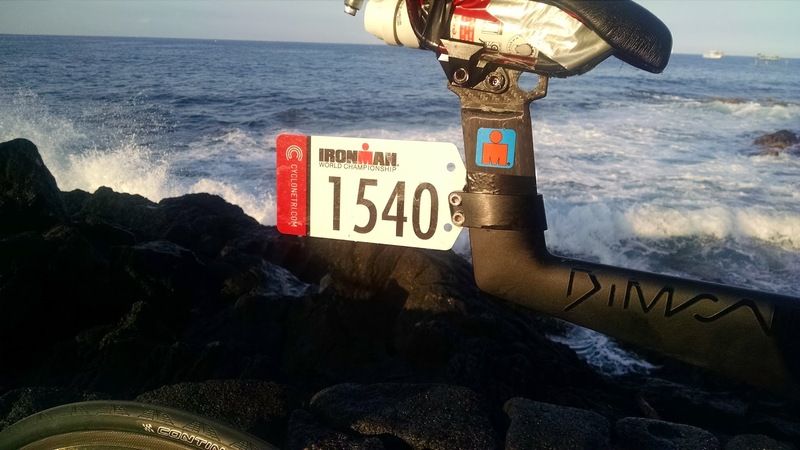 I had a terrible swim (I swam faster in Kona this year with no wetsuit, rough conditions and a longer course!). I need to figure that out, I should have been 5-6 minutes faster. 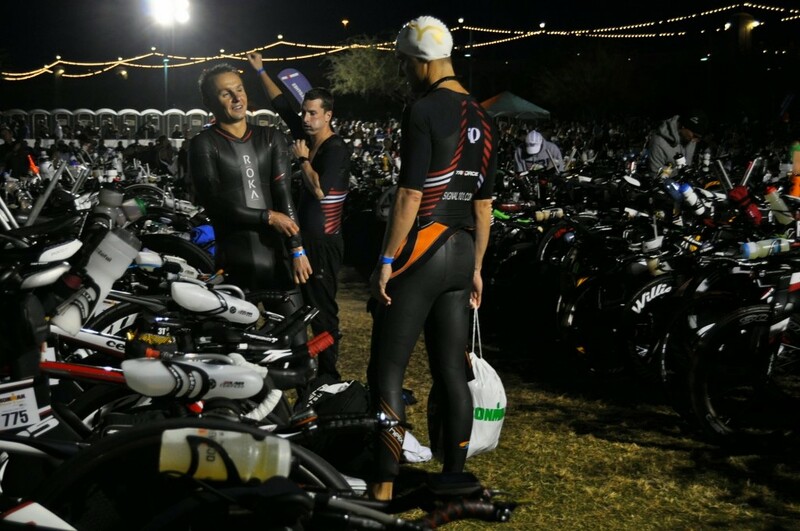 I’m a bit heavier than I was at IMAZ 2014, which was the last time I wore my wetsuit. I had the bike of my life and my run was a little slow but still a respectable 3:30 which I was happy with given that I’m not in the best run shape right now. I’m really happy with a 9:19, even though my primary IM goal now is to go sub 9 (next chance, IM Boulder 2016!). I don’t plan to do Kona in 2016, as I’m focusing on Ultraman, so above all I wanted to have a really solid training day out there and race hard with no fear of consequence. I had some really bad cramping issues in my left glute the day before the race, so I woke up feeling like a gorilla had been punching me all night. Other muscles would also just randomly cramp for no apparent reason, which is a bit concerning when you have a big race day ahead. The good thing about knowing ahead of time that you’re going to have cramping issues, is that you can anticipate it, and I was able to manage it during the race. I cramped at the start of the swim, bike and run, but I just relaxed and focused on maintaining a steady effort for 10-15 minutes and they went away each time. So in the end, the cramping really was not much of an issue. I was very satisfied being able to get through the day in one piece, the 9:19 and 2nd place was a bonus! The rolling start was a mess at IMAZ. Basically you enter via a wide set of steps, perpendicular to the direction of the course. So even if you line up near the front, if you are towards the left then you are actually several rows back once you jump in. Then once you’re in, it’s chaotic until you get clear of that. Given that the goal of this rolling start idea is safety, I think they failed at IMAZ. The mass start is much safer a) because you get to warm up b) there is more than enough space for everyone. Since my basic speed is quite good, I got clear of the mess pretty quickly, but I just felt very awkward for the whole swim, kind of the same feeling you have after not swimming at all for a few months. I also felt very constricted and out of breath. It took a huge amount of mental focus to stay calm. Maybe I’m too fat for my wetsuit who knows! Within about 15 minutes I knew I was going to have a bad swim time. When the people around you don’t look like competent swimmers, it’s a bad sign (since they are ahead of me, I probably look worse than they do!). Every pair of feet I found was either zig zagging all over the place, or swimming in the wrong direction. So I just swam alone the whole way. Bike 4:37 – very happy with that. From what I can tell by looking at the top 10 in each AG this was the fastest amateur bike split. 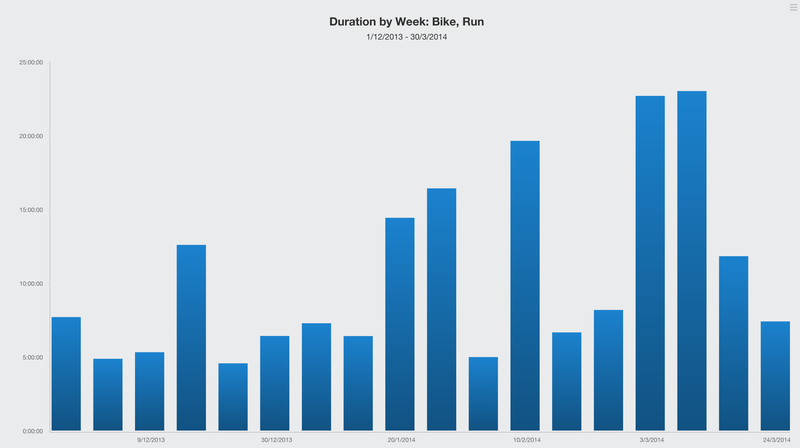 Here is a link to my bike data. The plan was to bike a bit harder than usual, like I will at Ultraman. Pretty much using IMAZ as a long, intense training day. The presence of competition, plus having aid stations makes it a great opportunity to do that. My first lap started off with bad glute cramps, but they resolved after 10 mins and that lap was done at an intensity factor of .85 which is closer to what I might ride in a half ironman. Laps 2 and 3 were more crowded so I had to ease off a bit more often with an IF of .81 which felt like a steady all day pace. My VI was 1.03 which is the lowest I’ve ever had in an IM. This was a bike PR and my best executed IM bike to date. I also had a very tasty nutrition assortment. On the bike, I flavored my malto/fructose mix with 2 bottles of “hand crafted” Q ginger beer, which was awesome. Definitely keeping that. I rounded it off with 8 gummy worms and 2 bags of powerbar cola chews, averaging 430 calories per hour. The XLAB Torpedo bottle is a great addition to my setup. I started with that, plus a bottle of my mix mounted directly to the Dash TT.9 saddle. My only take from aid stations was 2 bottles of water. I feel this really helps at IMAZ because the aid stations can get a bit congested, especially on the later laps. My bike setup is below. Zipp 808 front, Super 9 disc rear, 54/44 Rotor Q rings (which they say is equivalent to 56 at “peak” ovality, a huge asset at IMAZ, I didn’t spin out at all). Rotor 3D+ 165mm cranks, 3T Aduro bars, Dash TT.9 saddle with Pave Pria . I switched out the Conti tires for Turbo Cottons that Rappstar kindly lent me. Tririg Omega X brakes, Di2 shifting. Icefriction coated DA chain. Run: 3:30 I felt great getting off the bike, made a quick porta potty stop on mile 1, and then settled into a steady pace just going by feel, around 7:10/mile. At around the 10k mark I could feel my hamstrings starting to tighten up, like a very dull cramp. I also had minor shooting cramps on the outside of my glutes, which I just ignored but my pace did slow a bit for the same perceived effort. I hadn’t seen Scott or Steve at all the entire race. I knew Scott would be way ahead out of the swim, but I thought I would have been close enough to Steve to at least see him. Later I would find out that Steve unfortunately DNS’d and that Scott would eventually beat me by 30+ minutes, which explains why I saw neither of them! Other than that I had no idea what place I was during the race. I started the run with Jack Toland who won the 18-24 AG, but he left me behind within the first mile. It started to rain pretty hard, and I knew the cold weather would demoralize some people. Since my last few training runs were in the snow, it actually felt pretty mild to me! I knew it would be a race of attrition so I just kept a steady pace, didn’t walk, and just kept going. I saw nobody else in my AG, and nobody else that I even knew. On lap 2, the gravel path had turned into a mudbath. I tried to run on the grass but it was all mushy, so I ran on a single file line of bricks for as long as I could. I found Jack again around mile 17, and we ran together up until around mile 20. Side note: The warm chicken broth at the aid stations was just incredible! I was feeling good so pushed a little harder towards the end. My last mile was a superb 7:03 – I should get a side job as Tim Noakes’ poster child for his central governor theory! Here is a comparison of my 2014 vs 2015 IMAZ runs. You can see a definite slow down around mile 10. A key difference is probably the mental aspect of competition – in 2014 I was chasing down Adam Zucco, in 2015 I was on a long training run with no idea of my place or who was ahead or behind me. Here is my data file. The other aspect may have been run nutrition. In 2014 I was robotic about calorie intake, in 2015 I just didn’t feel like taking much in, but I should have forced it if I wanted to maintain good pace. OveralI was very happy that I got through it all without much going wrong. 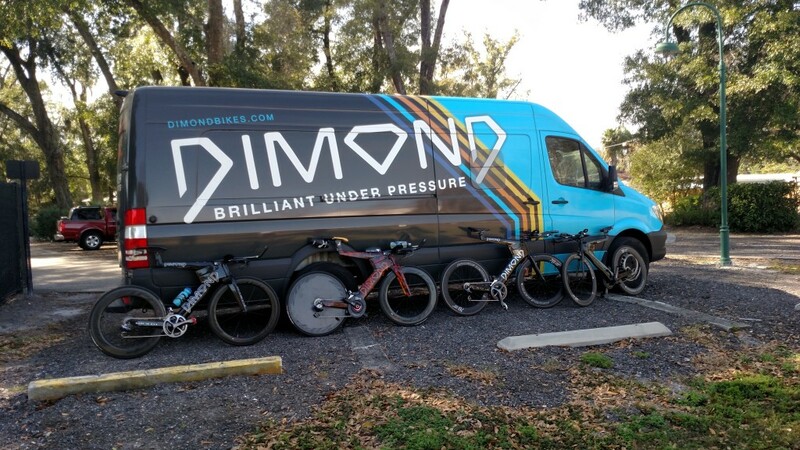 The awards ceremony was great – the Dimond team got 7 KQs in addition to 3rd, 5th and 6th in the pro race (TJ, Jordan and Maik) so a great day for Dimond! It was also fun to “give away” my Kona slot to someone who really wants to go there. 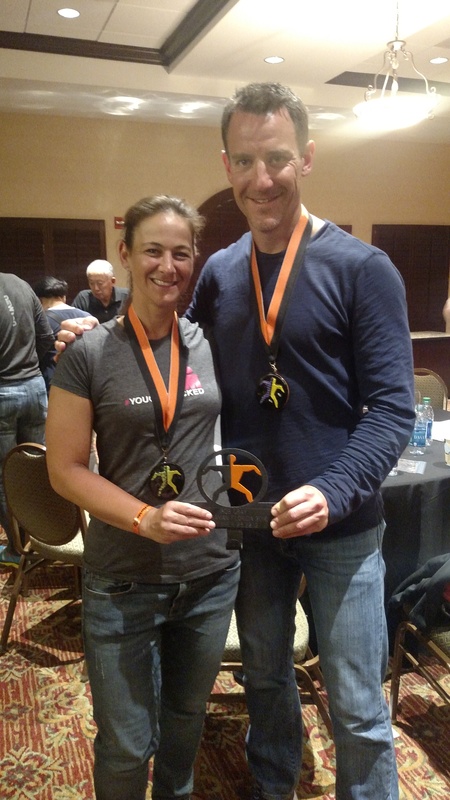 The best part of the day though, was that an athlete of mine got a kona slot rolldown in 40-44. He has put in so much work and really deserved it. He was actually in much better shape than me going in, but he didn’t have an ideal day out there. It was a bit of an emotional roller coaster going from disappointment the day before, to the high of a kona slot when it wasn’t expected. As a coach, it’s actually more exciting when one of your athletes gets a slot than when you get one yourself! Right now I’m straight into Ultraman training. I’m back on the bike and in the pool, but will wait a few days until I’m ready to run again. Then it will be a series of 100+ mile run weeks, lots of swimming, figuring out my wetsuit problems, and maintaining bike form until February! I do these race reports for a number of reasons. First of all, I hope that it provides some value to those who are thinking of doing this race in the future. 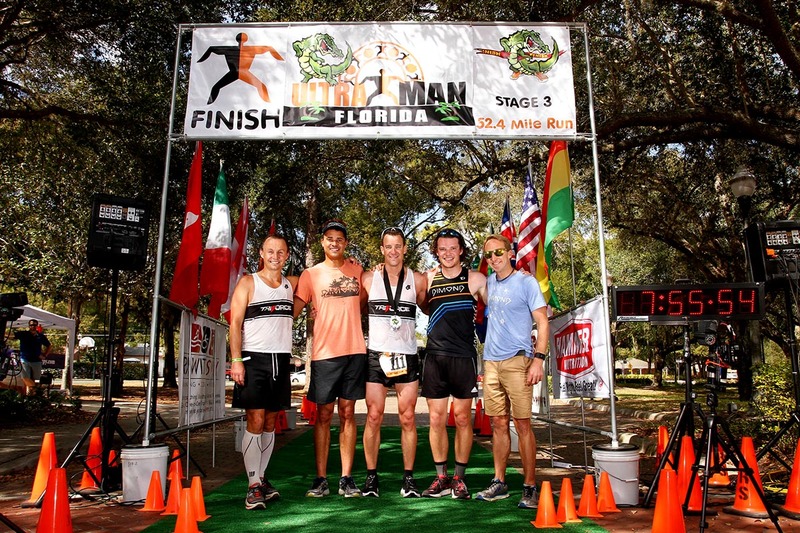 It may also prove useful to people doing another Ironman race, since many of the principles and lessons apply to any race. Secondly, I hope it provides some useful insight into my preparation and training. The real work in succeeding at this distance happens long before the race begins. I love the iron distance because of all the variables at play, that come together on race day to determine your success or failure; training, physiology, nutrition, gear, life balance, health, weight, body composition, mental outlook, stress, attitude. Let me start this race report with some background as to why I entered Ironman Arizona in the first place. it’s relatively local (I live in California). When you have a family, this is a pretty important factor. It just makes things a lot more difficult if a lot of travel is involved. The Triforce team had a whole contingent racing. We decided last year to do this as a “team race”, and we all volunteered at the race in 2013 to get our entries. It’s a lot of fun racing with friends. I’m tired of training hard over winter to do a spring Ironman, and wanted to KQ far in advance of Kona. This was a “one shot” race to KQ. If I didn’t qualify then I wasn’t going to try again for 2015. With 5 weeks between Kona and IMAZ, I wasn’t really sure what the recovery situation would be like. The basic structure would be race kona, recover, build, short 1 week taper, IMAZ. The “recover” block would just be as long as it takes. 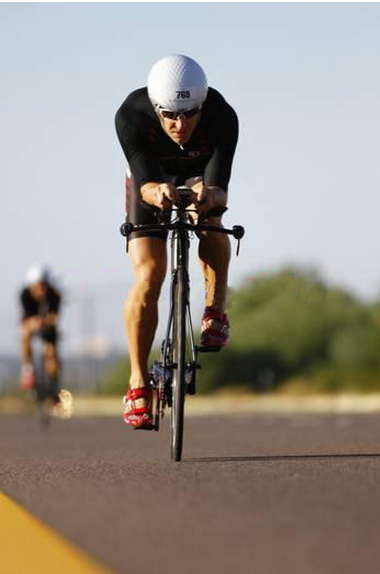 I determine a recovered state by doing “low HR TTs” where I measure pace vs HR on the run and power vs HR on the bike. 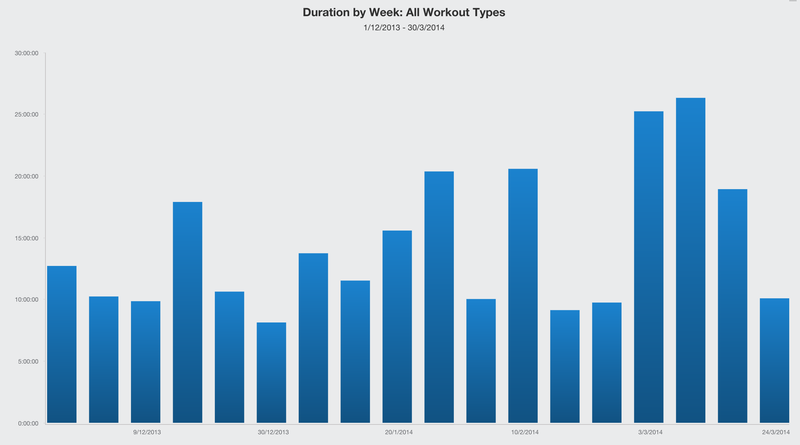 I need to see a run pace of around 7:00 – 7:15 @ 145 bpm on the run, and 260w @ 134bpm on the bike. 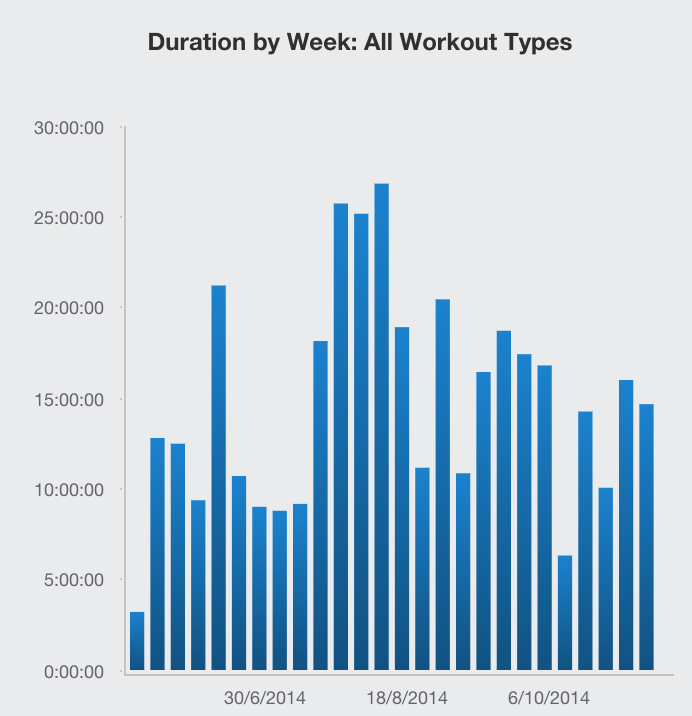 Based on past experience, I know that I recover much faster when I do light activity after a race vs complete rest. So the day after Kona I went for an easy 1.5 hour ride just to get the recovery process going. I also swam every day – swimming is such a great recovery tool; no weight bearing stress and full body activation especially if you include other strokes. 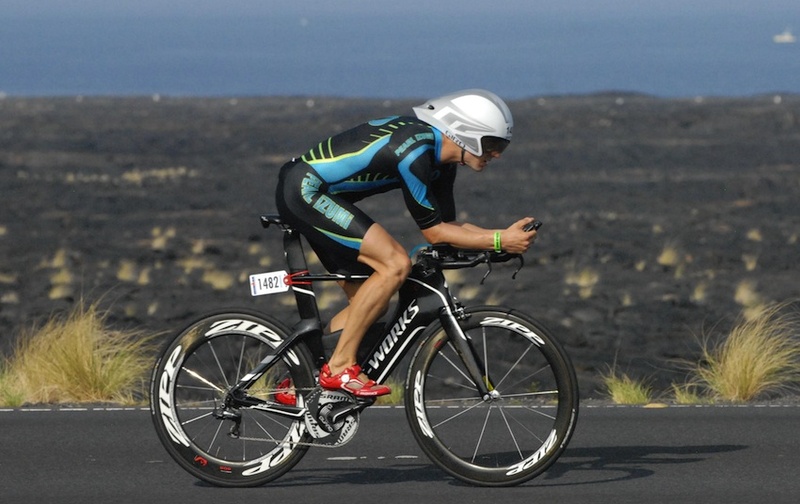 I managed to recover pretty quickly – it was about 10 days after kona when I resumed “real” training. We decided that I would do a 3 week block and 1 week taper. The purpose of this block would mainly be to maintain bike and swim fitness, and hopefully gain a bit more run fitness. I didn’t do much volume at all, no runs over 12 miles and most bike rides 2 hours or less (1 x 4 hour ride). 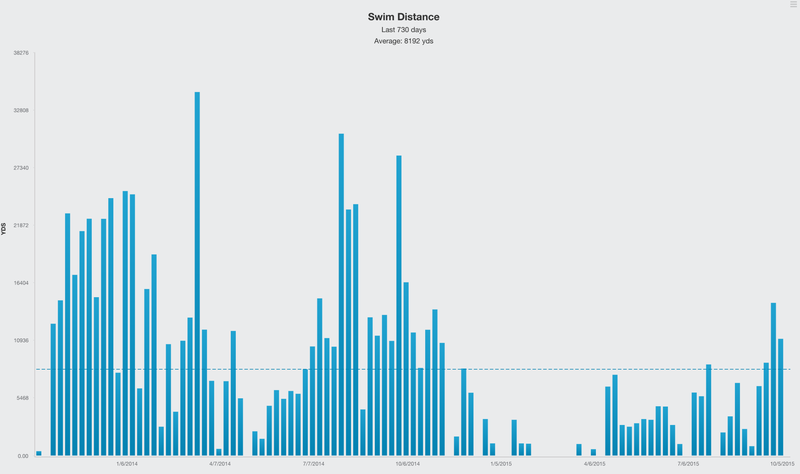 Swims were also relatively short (for me) – not much over 4K per session but most of it was at high intensity. Coming into the taper I felt really good. 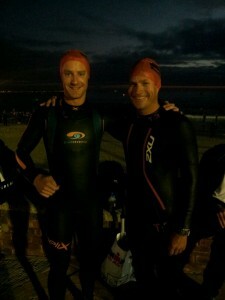 Swim form was pretty good; did a few open water swims in 57-58 mins and a few pool swims in about 55 mins (as 10 x 400m). Bike power was good, and run form seemed ok, but I would feel fatigue / soreness setting in at any distance over 10 miles. Despite that, I had faith that by race day, my run endurance would be ok again. So, I was feeling positive as race week rolled around, and ready to go! The one other element of pre-race prep is diet. For 7-10 days out, I eat a high fat diet with less than 150g carbohydrate per day. Based on my metabolic testing, this type of diet change has the biggest role to play in race-day fuel utilization (in terms of fat vs carb). I then eat about 400g of carbohydrate in the 24-30 hours before the race, which replenishes some glycogen without affecting fat burning very much. This type of diet prep results in a burn rate for me of about 650 carb calories per hour at 250 watts (and about 480 fat calories per hour, for a total of about 1100 calories per hour). Let’s take a quick step back for a minute and talk about my race goals. Get a good time. I felt I would achieve this unless something went really wrong. I wanted to swim under an hour (a long term goal I’ve had), bike around 4:40 and run around 3:15 – finishing close to 9 hours which would be a PR (my fastest IM before this was 9:40 at Kona). Qualify for Kona. This would be tougher. The M35-39 field would be super stacked, with at least 10 kona regulars and 5-6 guys who are definitely capable of sub 9 on this course. 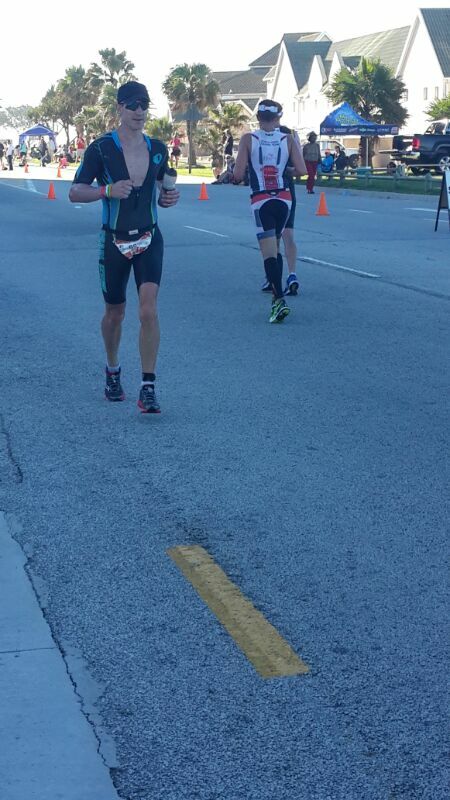 As it turned out, 5 of the top 6 age groupers overall were in M35-39 and there were only 4 kona slots. With most other races, you will find one or two really fast guys turn up, then it drops off pretty fast, meaning that I could make a few mistakes and still possibly be in a position to KQ. However in this race, I would have to have a perfect race, plus some other guys would need to not have a great race. Before IMAZ, I decided that if I didn’t qualify, I would not try to KQ again for 2015. So it was a “one shot” chance to do it, which really focused my attention and motivation to succeed. Kevin Coady: also my coach! He’s gone sub 9 at Arizona before, and has gone low 9’s in many other races. Very capable of running 3 hours or less. 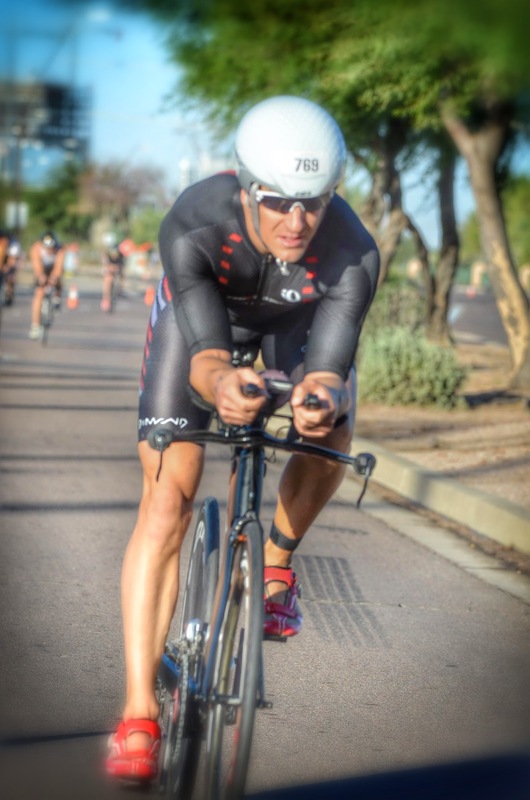 Adam Zucco: this guy is an animal swim-biker, with 70.3 as his forte, he’s no slouch when it comes to Ironman. 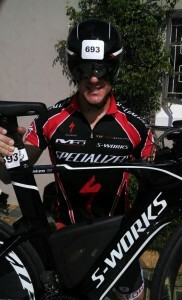 He dominated Oceanside and St Croix 70.3 earlier in the year (and probably a few other races that I don’t know about). 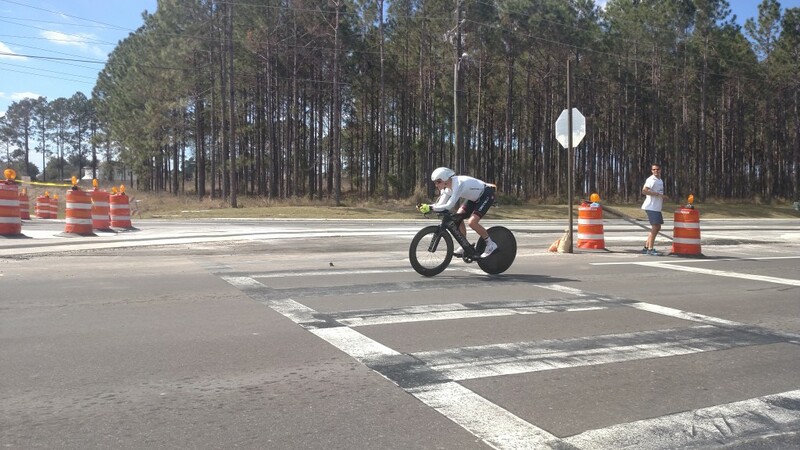 If this was a 70.3 race, Adam would probably beat all of us by a big margin! Like me, he had just come off kona 5 weeks before so I thought we might have similar fatigue issues on the run. 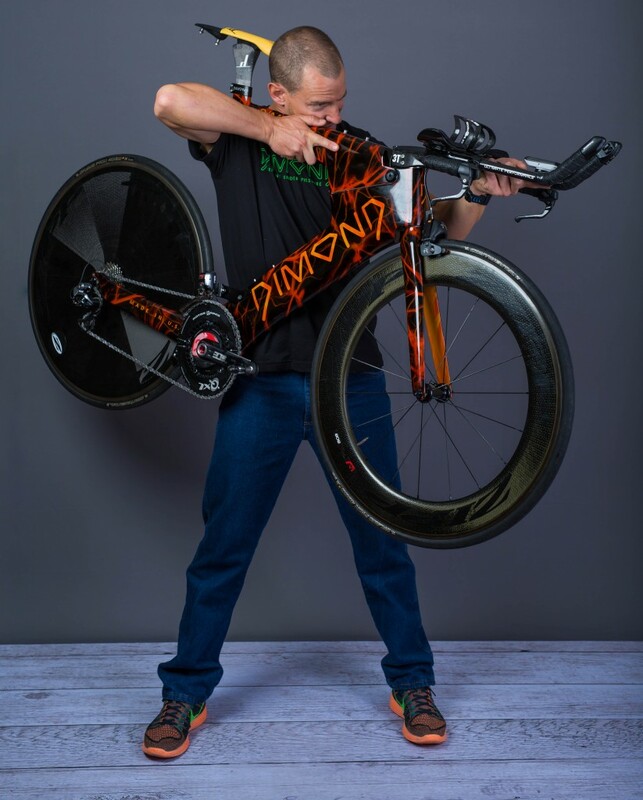 Scott Iott: This guy’s forte is the iron distance. He’s gone sub 9 before and low 9’s in many other races. His strength is the run, capable of 3 hours or less in an IM for sure. 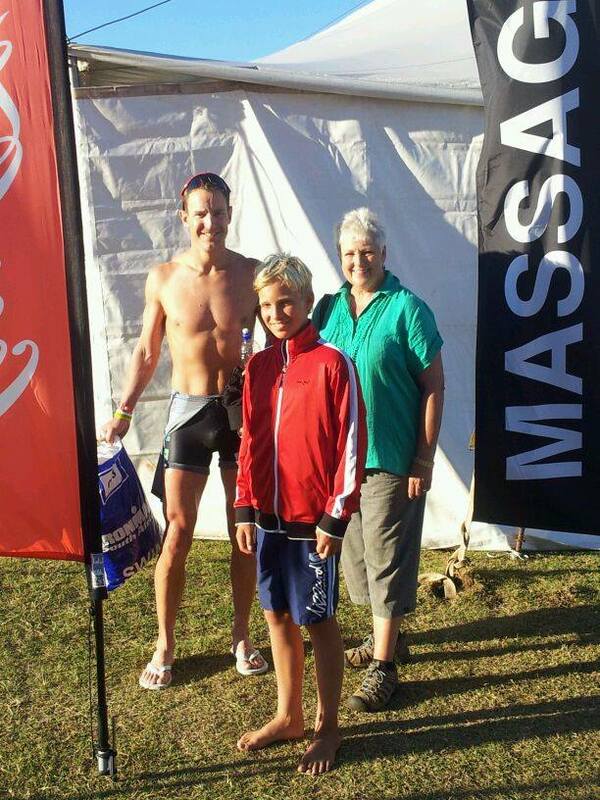 Trevor Glavin: He’s a friend of Adam and Scott – a great swimmer and a solid all rounder being a long-time xterra guy (but the swim is for sure his strength). He has multiple low 9 IM finishes to his name and seems to be super consistent in his execution – pretty much every IM he’s run about 3:15. 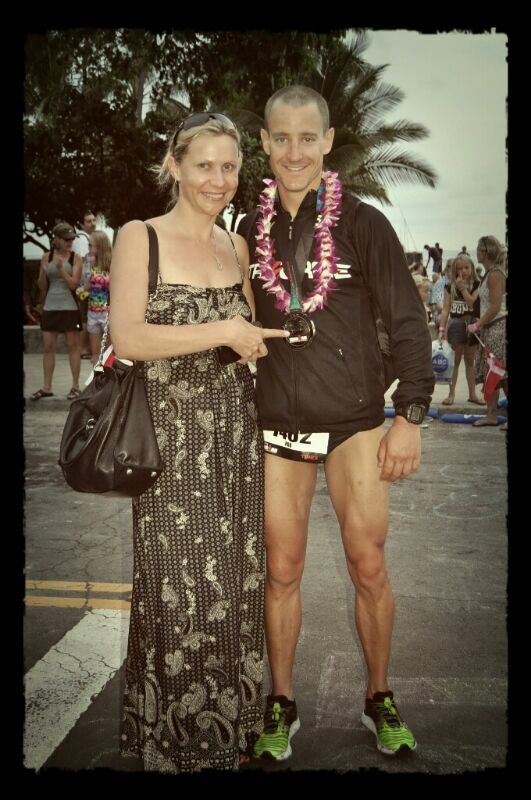 He finished Kona 2013 almost 30 mins faster than me and 2014 13 mins faster. 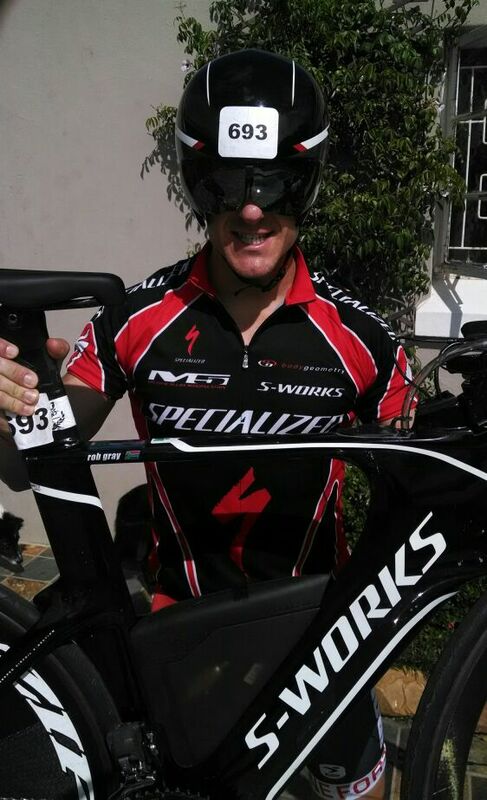 I felt I would be able to make up the swim difference on the bike, and for me a 3:15 is realistic on a good day. Adrian Lawson: this guy was not on my radar before, but it turns out he has some pretty solid results with some regular finishes in the 9:30ish range (including kona). Ivan O’Gorman: I’ve raced Ivan a few times although I’ve never met him. He’s a very good runner (like 3 hours and under) but I thought he’d have too much of a gap to make up on his swim (he’s in the 1:15-1:20 range). Still, his swim deficit on me is about equal to my run deficit on him, so he could very well be a “last mile threat”. 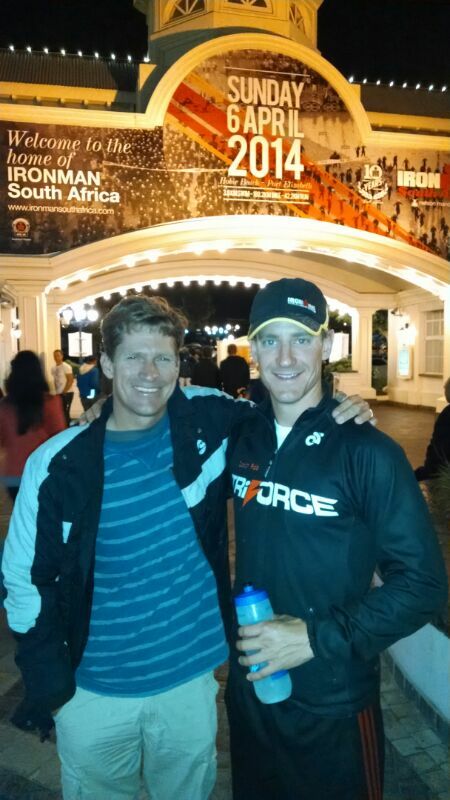 Li Moore: my teammate who has beat me twice this year over the 70.3 distance. 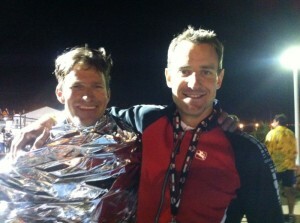 IMAZ would be his iron distance debut, so that was in my favor. I’m a faster biker than him but this guy can run 6:30s all day, so even with a big deficit off the bike he could run me down no problem (and he did just that in both of those races this year). I tried to get him to eat a lot of McDonalds in the weeks leading up to race day. So, usually there will be one guy like this that turns up, not nine! I honestly didn’t feel my chances were very good, that I would need to have a perfectly executed race, even to be in contention for one of the four kona slots. Thus, my main goal was to get a PR, and if I happened to be in a position to KQ I’d consider myself lucky. I flew down with the family on Friday (the last day to register). We stayed in a house (a must if you have a family!) so after dropping all our stuff there, I headed down to register and collect my bike. By the time I arrived there was no line (registration closed at 5pm, I arrived at 4:40) so everything went pretty fast. At 4:55 I collected my bike from TriBike (they closed at 5pm too!) and took it over to the guys at Dimond to have some bosses installed for my Torhans Aerobento. 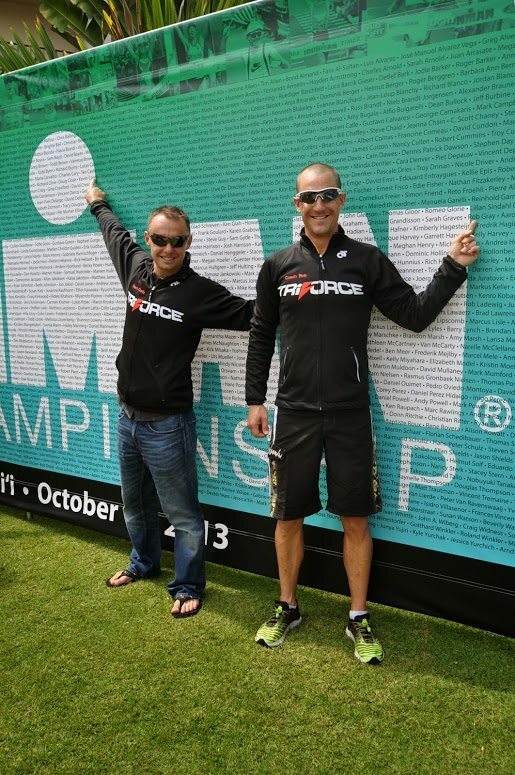 Those guys are awesome – so much support for me at both Kona and IMAZ. 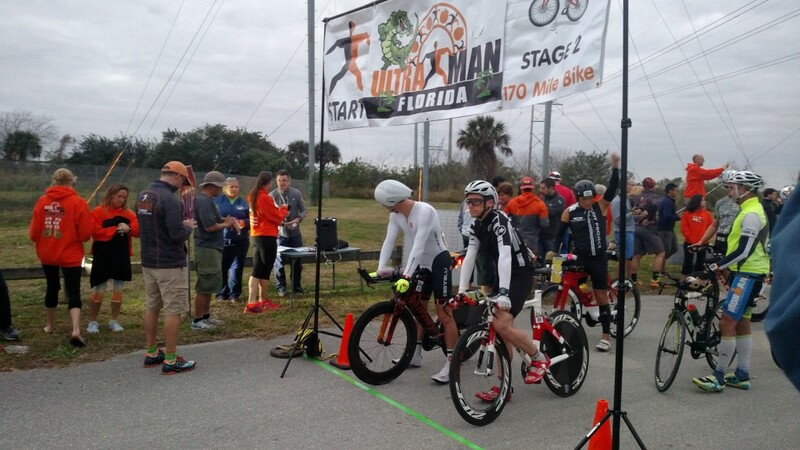 I saw pro Thomas Gerlach there and we chatted for a while about my bike, aero stuff and tires – I know him from slowtwitch but I’ve never met him in person – great guy with some good advice and perspectives! I then dropped my disc wheel with the mechanic to have new ceramic bearings installed, after which I quickly checked out the swim course from the bridges with my teammates (Kevin, Li, Snickers and Andrew) and then headed back home to relax in the hot tub. On Saturday, I spent far too much time on getting my bike ready. I put new tires on, did all the race numbers and spent some time adjusting shifting etc. before doing a quick test ride. It should have taken 45 min max, but for some reason it took me 3 hours to do all of that. Probably because I spent about half of that time tracking down my 3 year old son who was chasing pigeons around Tempe Beach Park (and unlike his dad he is the FASTEST runner in his age group!). I got back to the house around 4pm and then settled in for some extreme relaxation and eating! Most of the evening was spent in the hot tub. Dinner was pretty simple – some home made fish tacos, veggie pizza, some sweet potato and a single IPA. About 400g carbohydrate throughout the day, with a fair amount of fat and protein too. I’m very conscious to make sure that I’m at a calorie surplus before a race – the last thing you want is to enter a catabolic state on race day. Well, that’s my excuse anyway! That night, as always, I slept terribly. It always happens and I’m used to it. It feels like I don’t sleep all night, and then plunge into a deep sleep just before my alarm goes off! I got up at 4am, and went directly to the kitchen to eat my meal. My big change for this race was to eat a relatively high fat breakfast with very slow release carbs. I had 50g IsoPure Colombian Coffee whey protein, 300ml coconut milk (the one you buy in a milk carton) and 3 servings of plain UCAN superstarch. In addition, 3 x gluten free pancakes with a lot of butter and peanut butter spread on them. About 800 calories. At 5am my taxi arrived, and I was in Tempe about 20 mins later. The roads were closed so he had to drop me on the north side of the Mill St bridge, which actually turned out to be a good thing because there were 5 port-a-potties on that side (for the run course) with absolutely nobody around, so I got to use one without standing in line like everyone else in transition. I got to my bike, checked my tires (105 PSI rear, 95 PSI front), put my bottles on and checked the brakes for rubbing. Everything was ok so I put my wetsuit on, put my run bottle in my run bag and then found Kevin in T1 (his bike space was next to mine). Usually both of us are still doing stuff as the swim is about to start, but this time we were both ready well in time, and headed down to the swim start early enough to see the pro start. We then got in the water and swam to the front right where we lined up. Soon we were joined by some teammates and others that I knew (Li, Snickers, Andrew and my work colleague Derk). The start was delayed for some reason, but soon we were on the cusp of starting so we secured our positions and braced ourselves for the start. I was lined up about 30m from the right hand side, right in front, directly behind 3 guys who “looked fast”. In the photo below, I’m one of the white AWA caps on the right of the green kayak. Swim (0:59) goal sub 1 hour. I’ve been working on that goal for over a year and this was my final test to see if all that work has paid off. Time: 59 min – mission accomplished! I got to the mount line, got on my bike and turned the pedals. I heard a strange grinding sound then snap! my chain broke… I looked down and saw my chain lying on the ground. I had no spare chain, no way to fix it, I thought my day was over. It’s hard to describe the feeling when that happens. I started trying to figure out what I could do, when a security volunteer (thank you Rocky – you saved my race!) ran up to me and told me that the Tribe Multisport mechanic was just up the road. So I ran with my bike for a few hundred yards until I found him. He had a bunch of tools and a master link for my chain, and he set to work fixing it straight away. I decided to eat a gel while I was standing there doing nothing, watching everyone come by. Snickers was already past me, Andrew came next, then I saw Kevin. Not only was I losing any advantage I had gained on the swim, but the guys at the front of the field were getting away from me. Since there was nothing else I could do about it, I didn’t really stress much about what was happening. 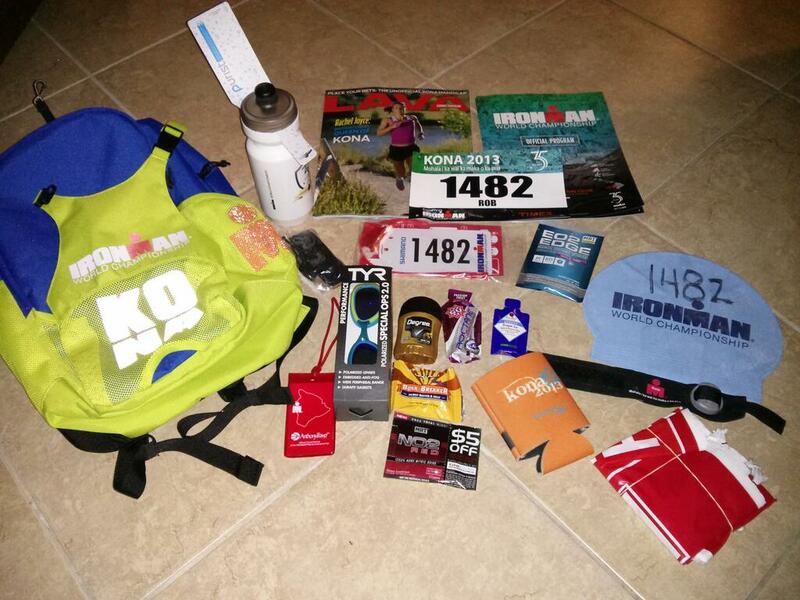 Ironman is a long day, and anything can happen. I decided that I would just do my best with what I could control, and that a few minutes lost here would not mean the end of my day. Six and a half minutes later I was back on the bike. There was still a strange rubbing sound coming from my front derailleur, and it looked like it was skew. However, I could ride and I could shift gears, which was the most important thing. I tried not to tell myself that the friction loss from the metal rubbing on the chain would not make a huge difference, but I think at the back of my mind I doubted that. However my speed vs effort was pretty good. Most of the time I was over 25mph between 250 and 260 watts, which was pretty good. That helped put any fears of “lost watts” to rest and I just got on with the race. Mentally I was now riding pretty hard, trying to catch up the lost time (even though I didn’t want to “burn matches” doing that). So I kept a steady but high effort all the way up to the top of the Beeline, in the process catching my teammates again. I kept a solid effort on the descent too, without much coasting at all. At this stage my mouth was very dry, I felt dehydrated despite taking in a lot of water. In fact I had been sacrificing my calories a bit in favor of drinking water, but no matter how much I drank I still felt dry. Coming down the Beeline was pretty nice on lap 1. It was fast and there was very little bike traffic. 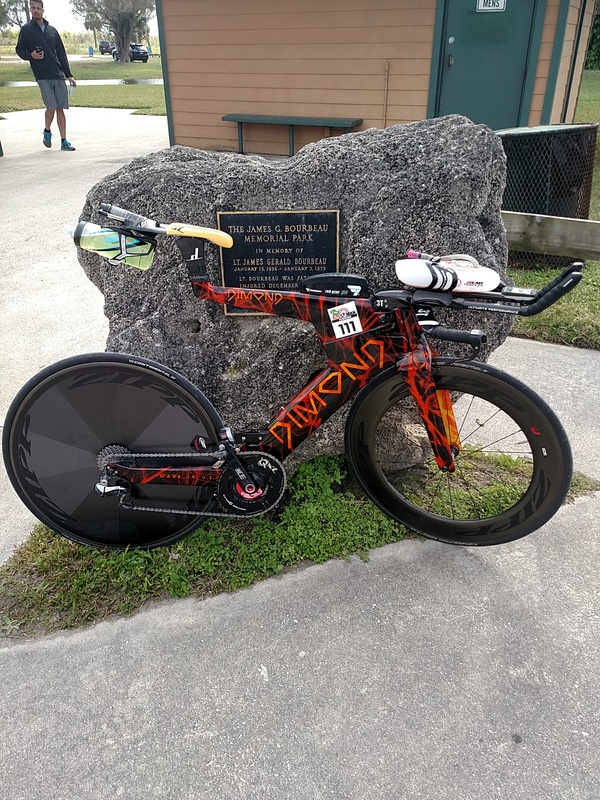 It was getting windy out there (to me the wind felt very similar to Kona) but as per usual my Dimond bike was super stable in the wind, even with a Zipp 808 up front and a disc on the rear I felt no sketchy moments at all. The reason I went with the Dimond in the first place is because of the clean lines and great aerodynamics (and because chicks dig it), but the biggest unexpected difference has been in the handling on long fast descents in the wind. I don’t consider myself a great descender, yet here I am on the leaderboard of this strava segment for the descent. As I hit the turnaround for lap 2, I focused on taking in the calories. I knew that I needed to get in around 500 calories per hour at 250 watts (I was at 247 watts at that point), but I had prioritized taking in water, so I decided to dial back the effort a bit and focus on finishing my first bottle (1000 calories) by the top of the beeline. I was quite diligent about doing that, without neglecting the water intake. Lap 2 was pretty tough. The slow riders were out, the wind picked up and it felt hot even though it wasn’t. I really had to stay focused in order to avoid the slower bike traffic, and in a few cases I was forced to do “bad” things, but that were better than crashing. At one point I was making a pass, and the slower cyclist moved over to the left. There was a pothole directly in front of me, with oncoming cyclists the other way, so I had to swerve to his inside and pass him on the right. It all happened in a few seconds and I feel that was the right course of action to take, even though I shouldn’t have done that. The second time, I was making a pass coming down the beeline, and a slower rider just pulled out in front of me to make a pass too. I had no option but to briefly swerve onto the yellow line and then back again. This was dangerous since I was between the reflectors, which if I hit them could have had bad consequences, but it was the only place I had to go. I’m really not surprised that there were a lot of crashes out there. The gusts of wind also didn’t help – pushing riders all over the place. Most of the day I was passing riders, but as I made the far beeline turn on lap 2, a super fast guy came past me on a Cervelo P5. I stayed a bit further than legal draft behind him (about 10 meters) down the hill and back into town. It was kind of nice, using him as a human shield. I stayed very aero and only paid attention to him – he seemed to be very in control of his bike and he was riding sensibly, so I left him with all the mental stress of riding past the slower riders, I just had to shout a bit to let them know I was there too. Later I would find out this was actually a guy in my age group named Adrian Lawson, a very solid athlete that I didn’t even know about until race week. I think he actually had the fastest age grouper bike split of the day, but he ended up with a DNF (it looks like he stopped after the bike). Needless to say, I was not able to stay with him on lap 3. At one point I was riding 300 watts and not able to keep up, so I just let him go. As I came back into town for lap 3, Kevin’s wife Caroline shouted to me that I was 8 mins back on the leaders. That was encouraging for me, since I knew that both Adam Zucco and Trevor Glavin would have outswum me, and I expected Adam to outbike me by a fair amount too. Add to that the time lost with the chain problem and I thought I’d be 15 mins down or so. I kept things steady until the beeline hill and then started cranking it. 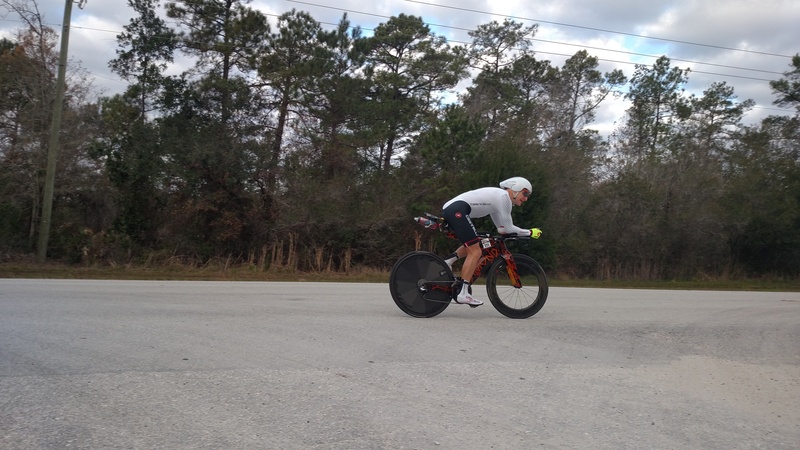 However, it just FELT like I was cranking it, in reality, the super strong wind was making for tough conditions that made me feel like I was working a lot harder than I actually was. 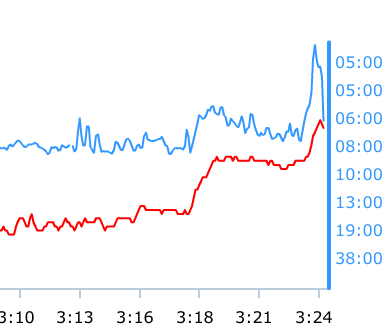 It turns out that I steadily lost power on each lap (247w, 237w, 230w), with perceived exertion going up. I counted down the minutes getting to the top of the beeline turnaround. It was such a sufferfest, but I knew once I turned it was basically downhill all the way back. Not quite but that’s what it feels like. I used the hill to finish as much of my nutrition as possible, but I didn’t get through it all. I still had about 700 calories left on my bike once I was done. Once I hit the final Beeline turn and started my descent, it felt a surge of renewed energy, like a horse on the home straight. It was even windier now, and more congested too so passing was very difficult and quite dangerous, but I managed to make it back unscathed. The return trip back to T2 felt super fast. I saw Scott Iott in front of me at some point and made the pass with several miles still to go. Being such a good runner, I knew he would catch me, but any minutes I could put into him would help for sure. From Ironman live coverage: as you can see at this stage I was 10 min down on Zucco, 5 min down on Trevor, 3/4 min on Doug and Adrian, 2 min down on Steve. Scott was about 30 seconds behind me. It’s a very good sign when you arrive in T2 and there is almost nobody there. I think there were 2 other guys in the tent. The great thing is that there are a lot of bored volunteers who all jump in to help. So I had 5 guys helping me get ready for the run. 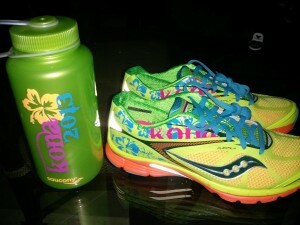 One guy on each shoe, another guy sorting out my run bottle and another guy getting my number belt and sunglasses ready. Thanks – you guys were awesome! I started the run just a short way in front of Scott. I felt super comfy but my garmin was showing 6:30 pace. I deliberately slowed down, since I was aiming to pace it out at 7:30. Despite my best efforts at slowing down I still went through mile 1 in 7:07. I saw Caroline and she told me that Trevor was leading and was 8 minutes ahead. I figured he must have biked in with Zucco and that Adam was still with him. The first 4 miles is an out-and-back, and I saw Adam as I was somewhere between mile 1 and 2. I figured he was at least 1 mile ahead. Scott ran past me at the 2 mile mark. He was running quite a bit faster than me, and I was running 7:15 pace. I thought that he was running a little bit fast but he looked very comfortable. I was feeling good enough to run with him, but I just let him go. I knew that a 3:15 was about as good as I was going to run, so running faster than that would just be a very poor pacing decision for me. 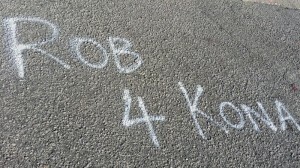 I saw Kevin coming the opposite way when I was somewhere near to the 4 mile mark. I figured he was about 10 mins behind me. I didn’t see anyone else, it felt like a ghost town out there, literally with tumbleweed rolling across the dust! From that point onward I just got everyone else out of my mind. This was my race to execute as well as I could, without being concerned about anyone else. I just focused on keeping the pace steady, holding it back and maintaining 7:30 as best I could. Even though it felt easy now, I knew it would feel a lot tougher on lap 2. I started the run with a bottle of frozen fluid (2 servings of UCAN) that I planned on finishing between 30 and 45 minutes. It lasted me an hour and then I switched to coke. I would just stop at every 4th/5th aid station for about 10 seconds filling up the bottle, then run a bit faster to make up my average pace. That worked a lot better than Kona where I stopped more frequently (no bottle). I saw Kevin again somewhere on the north side loop, and he was still about 10 mins behind. I knew then that if I didn’t fade at all, I may have a chance at 5th/6th place. As I finished lap 1, the crowd support was amazing. It really pumps you up as you run through that whole beach park area, with so much support and encouragement. 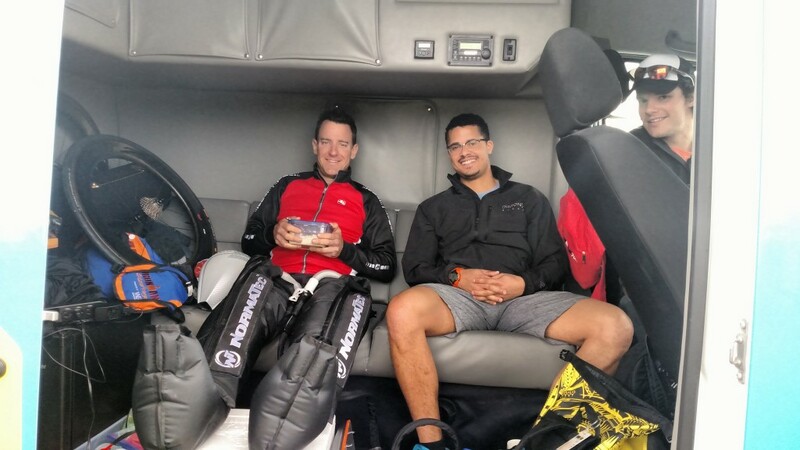 I saw Scott as I started the out-and-back section, and he had made really good progress. He must have been about 11 minutes ahead of me (or more) at that point. A few minutes later I saw Adam and he was only about 4 minutes ahead of me. That really fired me up to keep going. 7:30 was now a lot harder to maintain. It required a lot of focus and digging deep, just to maintain the same pace that felt so slow to me an hour earlier. I just kept on plugging away but no matter how hard I tried, I couldn’t see Adam in front of me. At mile 20 I saw Caroline again and she said that Adam was 4 minutes ahead of me. Dammit, he must have made a recovery! I then tried to push the pace a bit more. If I could cut 15-30 seconds per mile then I might have a chance of catching him. I gave it everything I had. Aid stations whirled by. I rationed my coke so I wouldn’t have to stop again to refill. With 3 miles to go I tried to up the pace again. I managed a sub 7 mile somewhere in there but it hurt quite a bit so I backed off a little. I pushed and pushed, chasing this mythical Zucco creature that loomed ahead of me somewhere. With a mile to go, my legs were crying out for me to stop. I just ignored them and told myself that I could rest my legs the whole winter. It was just 7 minutes of pain to potentially make up a single place – a place that could make the difference between a KQ or not. It felt like I was at my limit now, but I was only at 7:20 pace with my legs crying out. I still didn’t see Adam but I was determined not to give up. I ran up the finishing chute knowing I had given it my all for a finishing time of 9 hours 11 minutes. I high fived Kevin who was standing in the grandstand (he pulled out half way on the run). I was elated. This year I’ve not had a single PR, but I made up for that today with a 29 minute Ironman PR, a 4 minute swim PR, 6 minute bike PR and a 1 minute run PR. I got my medal and made my way to the massage tent, which was populated with pros and M35-39 athletes! I saw Trevor, Scott and Steve but no Adam. 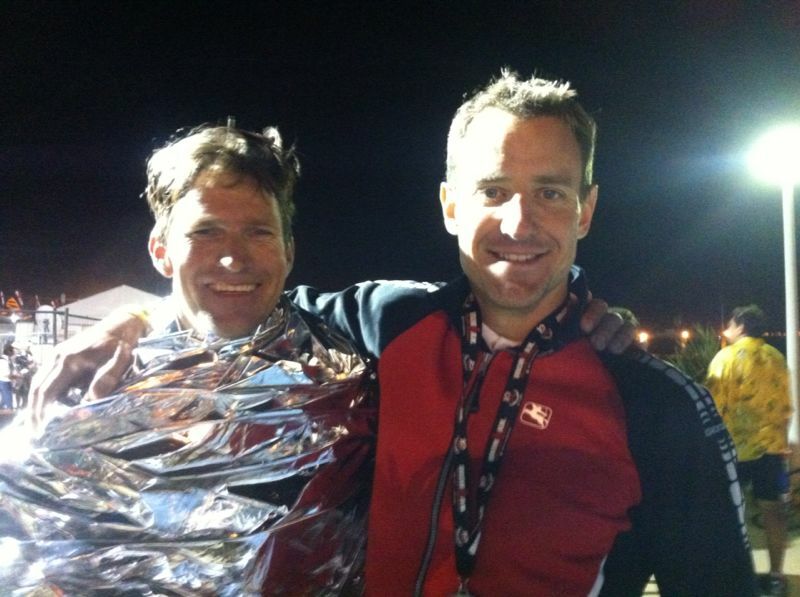 I then found out that Adam was actually behind me – I had passed him at some point in the last 10K without seeing him. Steve Johnson won, Scott was a very close second (with a sub 3 marathon), Trevor was 3rd and I was 4th. 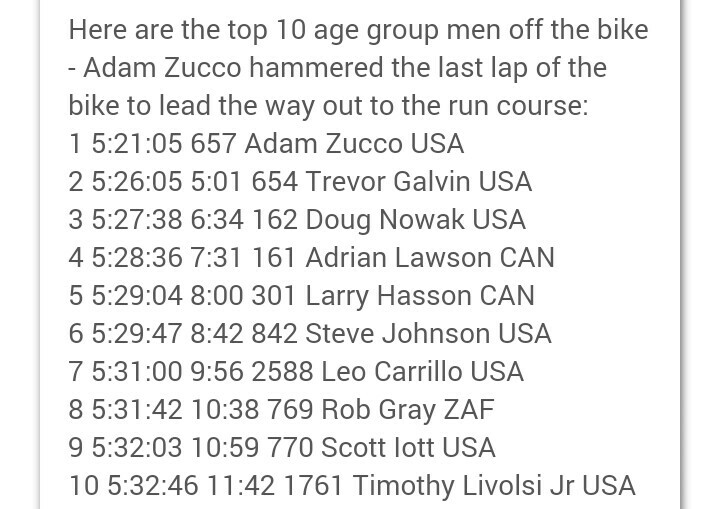 Adam was 5th but he got an early Christmas gift from Santa Steve who declined his kons slot. So I’m really looking forward to racing with these guys in Kona again. It was honestly a real honor to be on a podium with guys of this calibre. Casting my mind back to that moment when my chain broke… remember an IM is a long day, anything can happen so keep going and never give up! I’m super motivated to work on my run during the winter. Gaining 15 minutes on the run will get me sub 9, which now feels like a realistic goal. I think with the right work it is within reach. 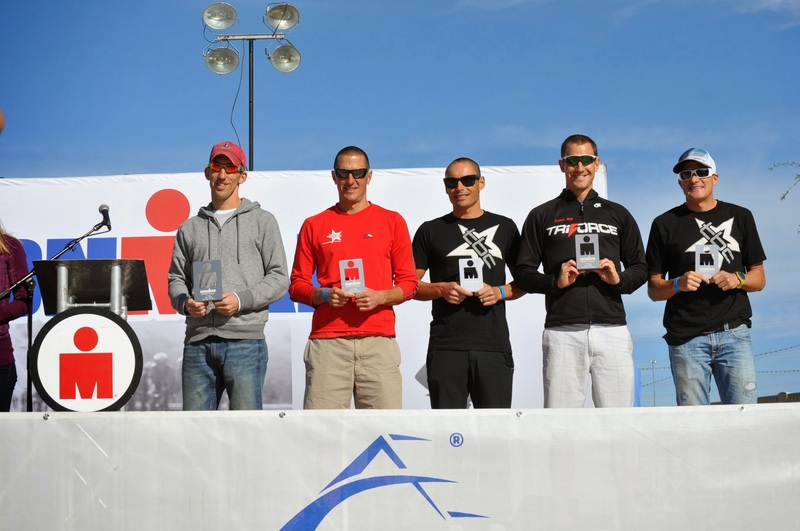 The “stacked” podium: Steve Johnson, Scott Iott, Trevor Glavin, me, Adam Zucco. It’s like a training bible sandwich – but we all know the filling is the most tasty! Here’s my (belated) download of the Kona race. I went 9:43 this year vs 9:40 last year. I swam faster, biked a bit slower and ran exactly the same. There is a short summary to start, with a more detailed account further down, and then a comparison of 2013 and 2014 at the bottom (edit: formatting went crazy so I copied the data into a linked google doc). I thought that would be interesting because there was only 2 minutes difference year on year. I biked a lot easier and was not much slower. Most of the reason for that I believe to be aero gains from new bike and position. The funny thing I was only 5 mins slower than 2013, on 10 watts lower NP, in tougher conditions. 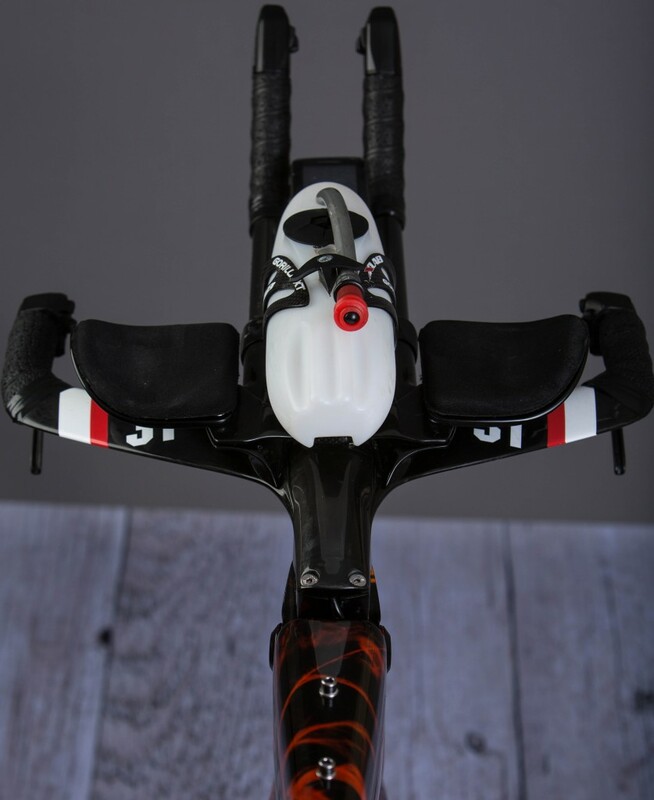 I attribute most of that to the new bike with a cleaner setup, more aero and most importantly enables a much more aero position. You can see in the pics below I’ve got a nice flat back (I was coasting down Kuakini here, I’m a little more upright when pedaling normally). I stayed in aero pretty much the whole way, except a few times I sat up on Hawi climb, and sometimes when being passed I had to sit up in order to fall back to legal distance. I’ve drawn up a comparison table of 2013 vs 2014 at the bottom which is some pretty interesting data. The Dimond was super stable in these conditions. Everyone will tell you how windy it was, this bike was rock solid. Ran very conservatively up till the energy lab, with the goal of laying down the pace back on the Queen K. It went mostly to plan, except the last part. I just couldn’t pick it up in the last 10K (in fact I slowed). But overall I feel like I executed most of the race well. Up the stairs, took swim skin top off, hit the showers. I should have rinsed my eyes out – they were burning with salt for a good part of the ride. You then grab your bike bag and run to the change tent. I had a bottle of ensure in the bag, which I managed to easily chug by the time I hit the change tent. The volunteer helped me pull the top of my octane on – so that was pretty quick. However I ran out to my bike with my cap and goggles still on, so I ran back quickly to hand them to the volunteer. Grabbed the bike and off I went. Coming out the water 4 mins faster than 2013 made a huge difference, because I started riding with a higher % of racers, instead of trying to catch them from behind. I kept it super easy for the first 30km. A few guys blasted past me on Kuakini but I just let them go. As for the others, there were some huge packs up until mile 20/30. These were really unavoidable due to so many athletes being out at the same time. I think the officials did a great job of enforcing the drafting rules, by letting everyone get sorted out for the first bit, then clamping down hard once everyone was out on the queen k. I was pretty lucky in that I was stronger than most riders in the packs, meaning I could just lay down constant power, and slingshot wheel to wheel for a long way while still being legal and not burning any matches (I was still riding well within myself, about 235 watts vs the 255 that I thought I would be riding at this part of the day). Most riders were doing their best to stay legal, but I saw some blatant wheel sucking too. I was happy to see a full penalty tent All the way to Waikaloa felt like a nice easy warmup – just past the resorts we were hit by a strong headwind and I managed to get clear of the packs pretty easily. The cross winds were also pretty crazy – at one point I got blown all the way over to the left hand side of the road. There were still a few good riders out there so I had company most of the way up to the start of the Hawi climb. As we started climbing up Hawi, the head/cross winds were pretty incredible. Even though we were climbing (relatively slowly), it was difficult to let go of the bars at all without losing control. At that point I was getting pretty worried about the descent, since we’d be hit by the same winds, but at 40mph+ downhill! 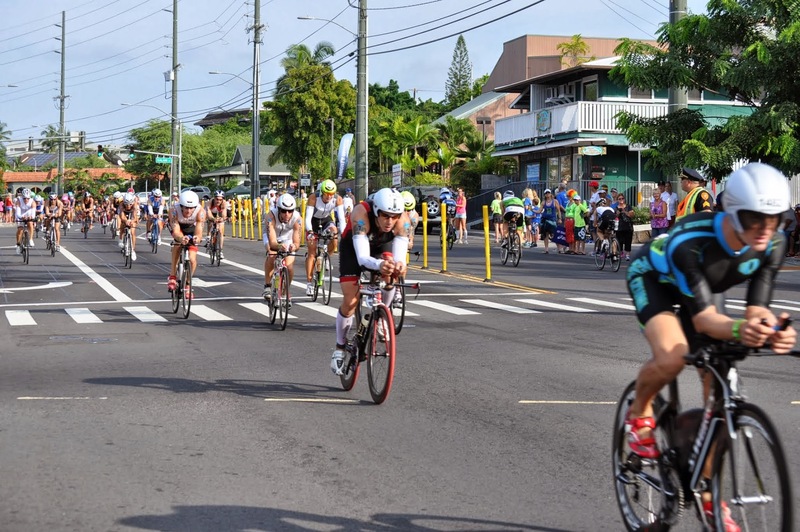 The Hawi turnaround came pretty quickly, and yet again the penalty tent was overflowing. This was the last time I saw any big packs – there will still a lot of riders out there but it was now very easy to stay legal. The Hawi descent was a lot easier than I was expecting. I coasted for most of it. 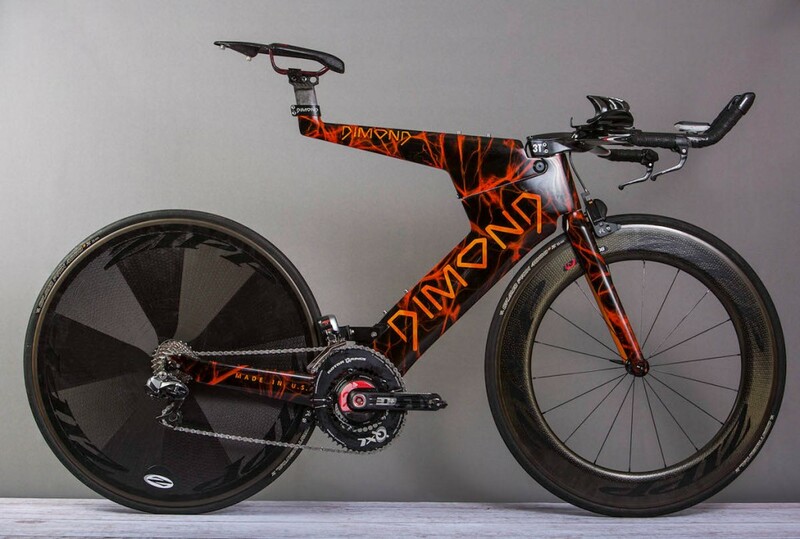 My new Dimond bike was incredibly stable in the crosswinds, I didn’t have a single sketchy moment and it gave me a huge amount of confidence on these exposed windy sections. 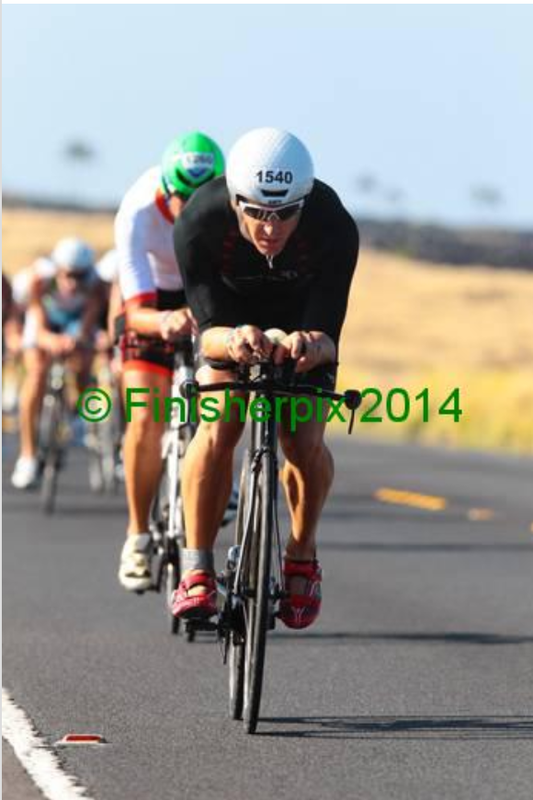 A few guys blasted past me on the Kawaihae climb, but since I was already doing 300 watts I let them go! Back the on Queen K, and it was into another headwind for a bit, before going through the most fun part of the day. Leading up to Waikaloa, a tailwind hit us and just pushed us along like crazy. I was doing 44 mph without even pedaling! At that point I was 3:45 into the ride, and a quick mental calculation had me thinking that a 4:3X would be on the card if this wind kept up. Unfortunately, 4 mins later we were hit by a headwind that slammed us right back to 18 mph, then 12 mph… ok, so back to a 5 hour estimate! Guys were now dropping like flies – clearly the conditions had taken their toll! I kept it pretty even, just burning the occasional match to jump gaps. I kept on taking in water at the aid stations (one bottle at the beginning of the station, one at the end, drinking ¾ and dumping the rest on my back). 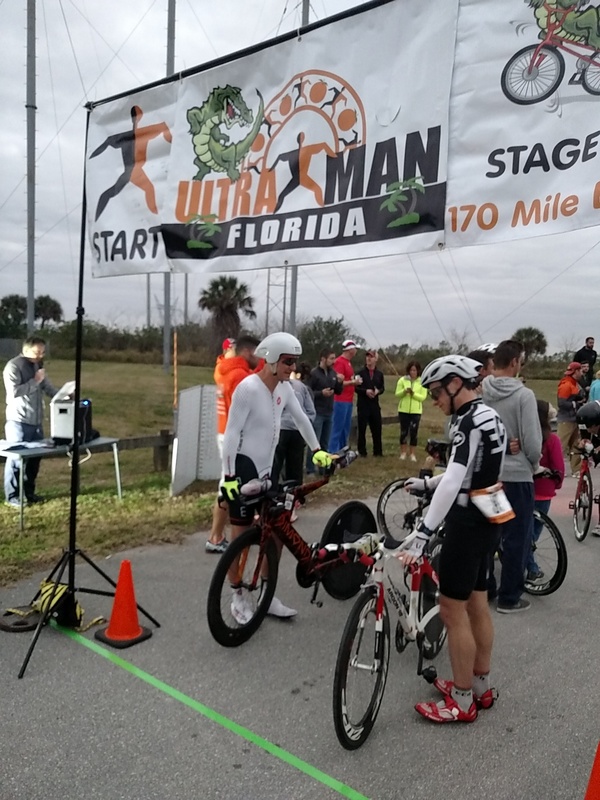 I was still feeling great at the 100 mile marker – which was surprising since I’m usually very ready to be done by 90 miles. The remainder was pretty comfy and I was now passing a lot of people. 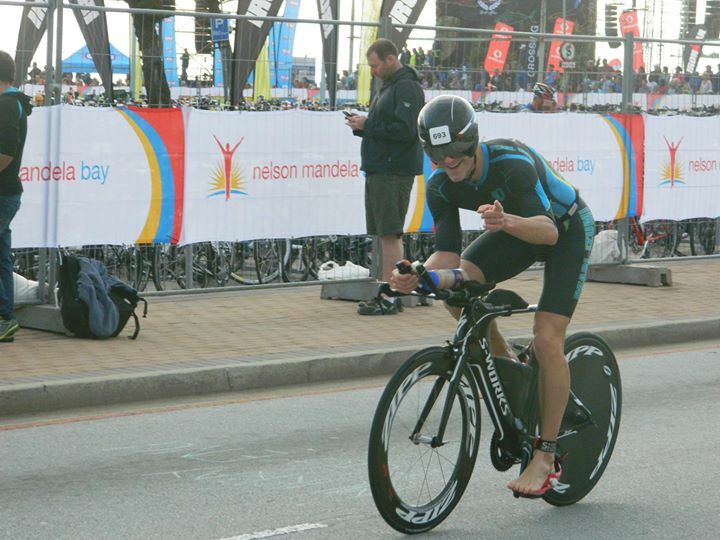 I rolled into T2 feeling nice and fresh – the litmus test being when you hand off your bike and try to run – in 2013 I was super wobbly and in 2014 I felt fresh and ready to run. 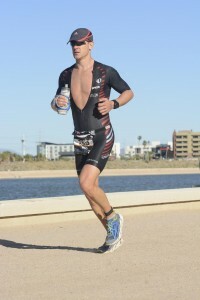 In T2 I changed out of the Octane and into a speedo + run singlet (great cooling!). I do lose quite a bit of time doing that so one day, if I’m in contention for a podium etc. I’ll probably just run in the Octane. I started the run feeling strong. My goal was to run 7:30/mile, which felt painfully slow for the first mile. I held the 7:30 for most of it, but them some weird quantum physics took place around 0.8 miles and I went through mile 1 in 6:59. I managed to hold around 7:30 pace for most of Alii drive, up until Palani hill where I walked. Back up on the Queen K I was still feeling strong, but running within my comfort zone like Kevin had told me to. I kept it comfortable all the way into the energy lab, and then stopped at special needs to pick up another bottle (next time I won’t do that). I walked again at various points up the energy lab hill then prepared to unleash the pace back on the Queen K. However, the unleashing wouldn’t come! As hard as I tried to push, there was no answer… my perceived effort was rocketing up and my pace was dropping. I calculated that I just needed to stick to 8:00/mile to beat my 9:40 from 2013, which I managed until mile 23 but then I did 3 x consecutive 9 min miles which put that plan to bed. I put in a 7:03 for mile 26 which made for a nice strong finish, but it wasn’t enough to sneak under my 2013 time. Still, on a tougher day, I was very happy with a time only 3 minutes slower. Overall, I thought I executed the race really well. I still need to figure out the final part of the run, but I think with another couple of Konas I’ll be able to nail that too. I thought it would be interesting to take a look at 2013 vs 2014. I originally pasted in a table here but it comes out in a weird format. 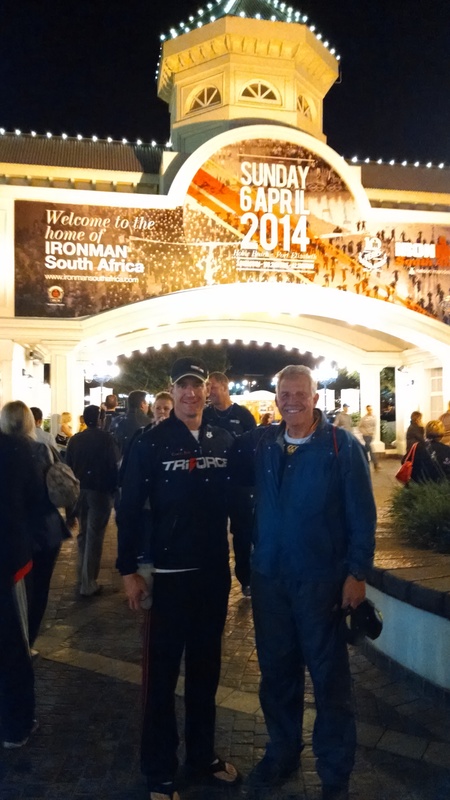 Ironman South Africa – a sprint finish for the podium! – My brother-in-law Grant and I have shared many adventures since we were “young”, so it would have special meaning to take part in an Ironman with him. – It would be awesome to stay in a friendly home environment, catered by sister Nikki! – It’s a beautiful course (even more so this year with the new bike course). Run 3:24 (not my best time but I was happy with that considering the tougher than average bike course, and strong wind during the run). Finished 29th overall, 3rd in AG. 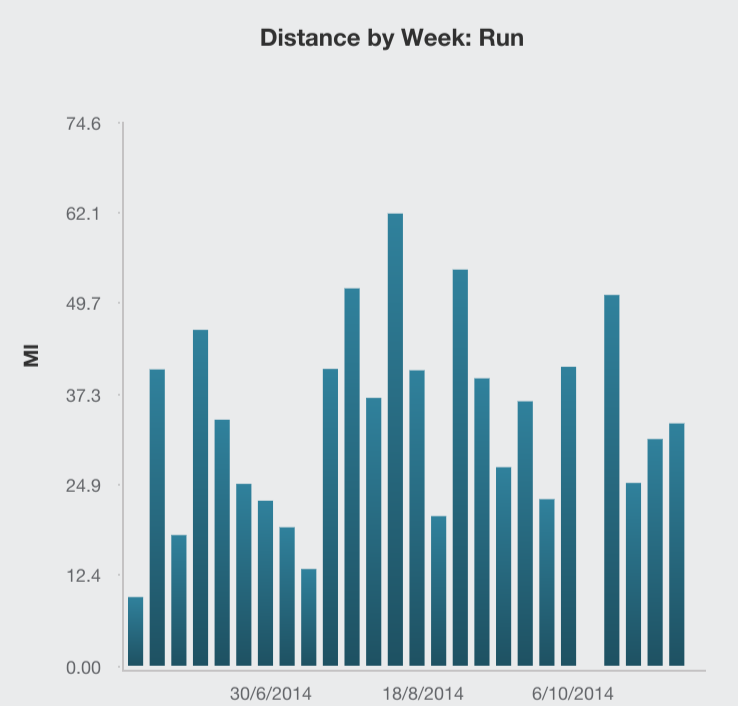 Here is my run data. Sprint finish to take 3rd place! my fastest mile of the day was mile 26 (6:30) with the last half mile @ 5:44/mile… That made the day super exciting. 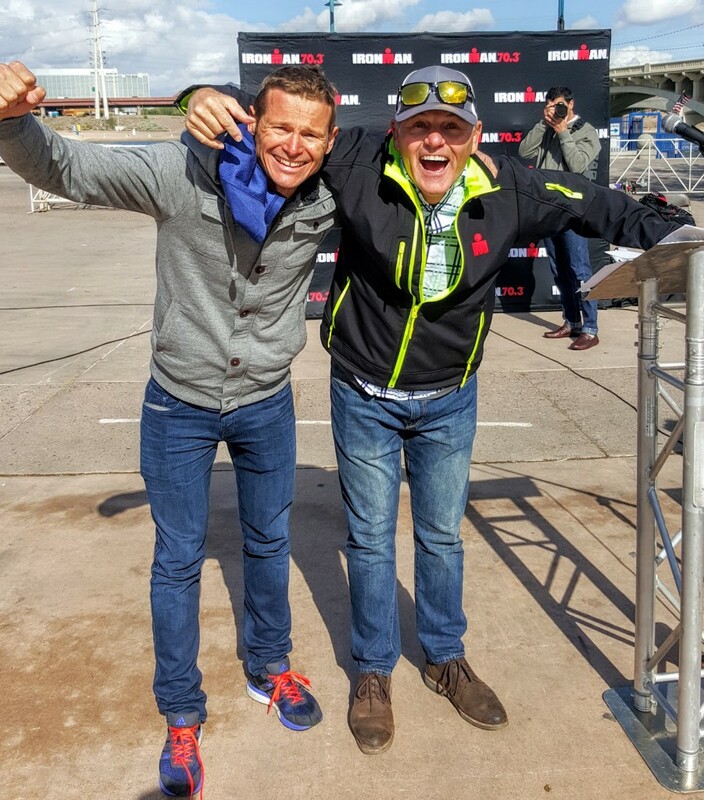 – St Croix 70.3 will now be a “pressure-free” race and I can focus on having fun! – Full details and pics in “long version” below! After IM Los Cabos in 2013, I decided to not race another early season Ironman again. I had a great race in Cabo but the long training days over the dark/cold winter are really tough; it’s just a lot easier getting big training done in the daylight hours of summer. However, after Kona in October, I decided that I would like to race IMSA in 2014, since I may not get the opportunity to do so again soon. The race seldom sells out, so I was pretty relaxed about getting my entry in. The day I decided to pull the trigger, the event sold out! Appraently the fact that it was the 10th anniversary made it that much more appealing to everyone! I put my name on the waitlist, but honestly didn’t think I’d get a place. A few weeks later I received the confirmation that I was in! I was already entered for St Croix 70.3 on May 4th, so after talking through it with Coach Coady, the plan was basically to do IMSA on half-ironman training, with a 2 week IM specific block before IMSA. From Dec 1st through April 1st, I only averaged 14.5 hours per week (low for me), with two bigger 25+ hour weeks in March (big for me). Everything was high quality with very little “junk” in there. Most of December and January would be focused on improving my swim, and just maintaining good bike and run fitness. 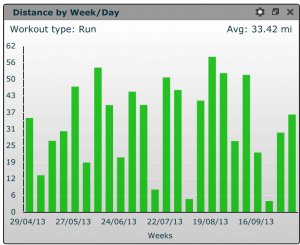 I also took a really long time to get back into running shape after Kona. In fact it wasn’t until February that I saw some vaguely decent numbers coming back (by decent I mean pace vs HR for specific efforts). 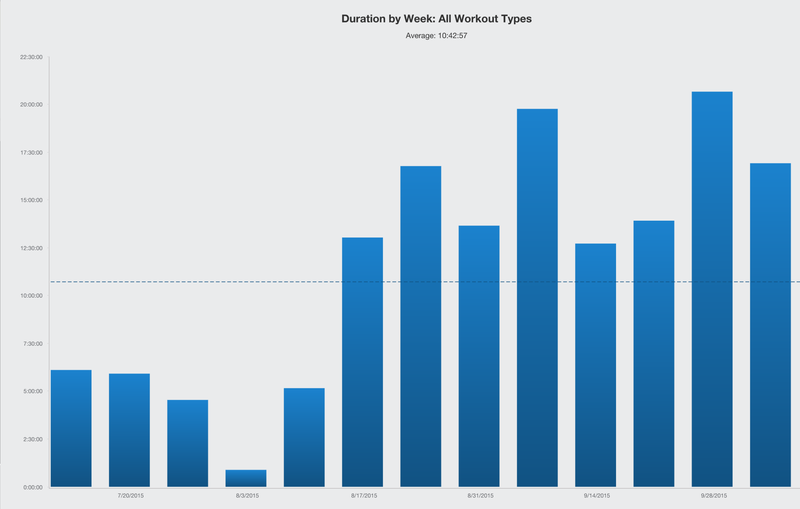 So February and March were solid training months, getting back my form just in time for two high volume, high quality training weeks (mostly run bike with a little bit of swimming) as my build for IMSA. If you exclude swimming from my weekly volume, you can really see I did low volume (but very high quality) for most of winter. Most of it was under 10 hours, but I ramped it up for the critical IM build phase. With the return of my form, my race confidence also returned. I was now looking forward to race day, and I knew that I had done enough work to race for a chance at a kona slot. PMC sidebar: For those that train with power and are familiar with TSS/ CTL etc. 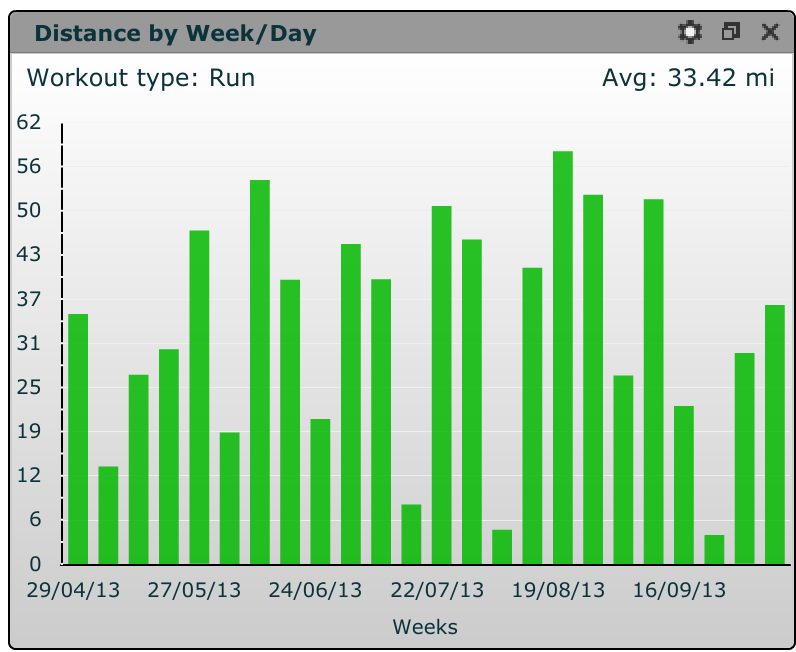 here is my Training Peaks performance management chart. Peak CTL 2 weeks out was 144. 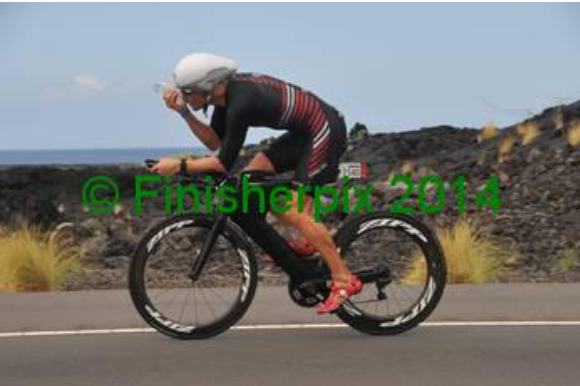 My peak before kona was 170, but that was 3 weeks out. However, my CTL with 2 weeks to go was also around 144. My main take away from that data is that it’s critical to time your taper correctly, taking into account your ability to recover, and how fast you lose fitness. There is a trade off during the taper, where you are gaining freshness but losing fitness at the same time. You want to arrive on race day being fresh enough, but without losing too much fitness. I think we can still fine tune the taper a little bit, as I was feeling “like superman” on April 1st. I flew out to South Africa on Sunday evening, a week before race day. 38 hours and 3 flight connections later I landed in Port Elizabeth. Jet lag was going to be an issue, so I had started getting into the new time zone on the plane, by taking melatonin at my “new” bedtime, followed by benadryl to keep me sleeping. 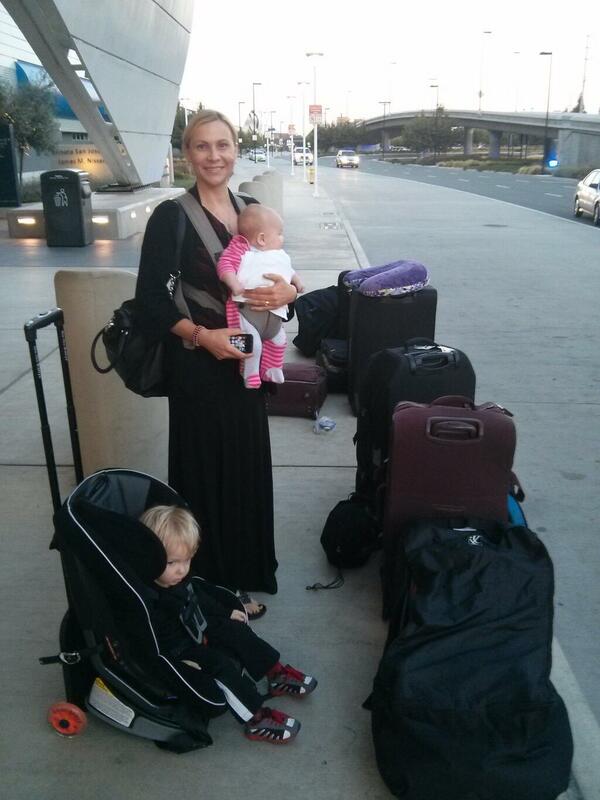 I slept sporadically on the plane trips, but it must have been ok quality wise, since I arrived feeling quite fresh. My parents met me at Johannesburg airport and flew down to PE with me. It was really great to see them again (I’d last seen them 18 months ago). My sister Nikki met us all at PE airport and whisked us back home to get settled. It was great to see Grant and my two nephews (Ben and Caleb) again, and after some rigorous unpacking Grant and I headed off for a quick bike ride. I felt amazingly good, as I said before “like superman”. The watts were falling from heaven without much effort at all. This was a good sign, although I always get a little worried when I feel so good and race day is still 4 days away – I need to be feeling like that ON race day! I knew that I had to do just enough training to “keep the rust off” without building any more fatigue. We did a quick swim that night then back home for dinner. Talking about dinner, I have been fine tuning my race-week nutrition, and this was my first test during an actual race week. Basically I would eat high fat low carb from one week out, then boost the carbs on Friday, eat normally Saturday, race Sunday. Most meals were made up of stuff like bacon, eggs, avocado, and some veggies. More details on that below, but I feel like I’ve nailed the protocol and will repeat it for future ironman races. On Thursday we went to register. I took a bit longer because I had to stand in the “internationals” line and Grant could go in the “locals” line. I had to sign an extra credit card form, which would serve as payment should they have to take me to hospital during the race, and avoid being taken to a state hospital (which you really do not want to happen in SA). I was a little reluctant to put all my CC details on a piece of paper, but I’d rather be defrauded than end up in a state hospital! On Friday, I did a 10 min easy run followed by 3 mins @ VO2Max pace (a bit faster than 5K pace). This in theory boosts the uptake of glycogen into the muscles once you start eating carbs again. I followed this workout immediately with a high-glycemic carb breakfast (waffles and syrup, yeah baby! ), and then 50g high GI carbohydrate per hour for the remainder of the day. High GI is good in this case, you DO want an insulin spike because insulin is a storage hormone that is needed for glycogen to be effectively stored in your muscles. It’s important to not eat too much at once, and spread it out at about 50g/hour. To make it easy, I made 900g of white rice (cooked weight), and mixed that with some honey, cinnamon and condensed milk. I would then eat 200g of that per hour until it was done (5-6 hours). I also ate some sweet potato for lunch, a few slices of pizza and some oatmeal for dinner. Saturday was back to normal, but relatively high carb eating. Oatmeal breakfast, hake (white fish), white rice and sweet potato for lunch, sweet potato mid pm snack and a large bowl of oatmeal for dinner. I also took 2 scoops of Osmo pre-load. I went to sleep at 8:30pm and slept soundly until 11:30pm. After that I was lying awake the rest of the night. I decided to get up at 3am and eat breakfast (small bowl of white rice mixed with ensure) so it had time to “pass through” by morning time. Grant was awake too, so there there 2 of us were, foam rolling in the lounge at 3am! I finally fell asleep at about 4am, only to wake up to my alarm 30 minutes later. Well, at least I got a good night’s sleep on Friday night! All the bags were packed, so after a quick bathroom visit I put on my tri suit, wetsuit (bottom half only), put some sunscreen on and then we jumped in the car, chauffer driven by my sister Nikki and my Dad to the start. Grant and I quickly pumped our tires, I put my nutrition on my bike and then we got into the water for a quick practice swim. After that we got out, said hi and bye to my folks, Nikki and and the boys, before getting into the “wave 2 start chute” behind the pros on the beach. With 1 minute to go, I adjusted my cap and it tore down the middle. Fortunately there was a referee standing on the beach and he was able to give me a new one with 30 seconds to spare. Half a minute later, BOOM! the canon was fired and we were off… I ran down the beach and towards the right, diving under the waves and started to swim. I started off strong but steady, and didn’t have very much contact until the first turn, where I had some but not as much as I’ve had in the past. I found a set of feet and just settled in behind him. He seemed to be sighting well, so after a while I just put my head down and followed him. We were swimming right of the main group, maybe a little further than we needed to, but I took the option of just staying on his feet. I saw Nikki as I rode out of T2, she said I was 17th in my AG coming out of the swim. This would help me track my place as I progressed through the field on the bike. As planned, I started off riding easy, allowing me to warm up and get the blood flowing into the legs. Shortly after the start, it’s pretty much a gradual uphill for 7 miles, where I kept the power on the higher end of my race pace, but not too high (for me, this meant around 250 watts). After the climbing there is a long fast downhill where I was hitting 42 mph (68 kph) – the wind becomes slightly gusty and side-on half way down this hill, and my bike was shaking around a bit. Holding on for dear life, I made it down but made a mental note to go a bit slower on lap 2. After a long fast rolling section with a tailwind, we turned right into the new hilly section of the course. The climbs were pretty manageable, and I had to really hold myself back; my power was reading above 300w and I was trying to stay at around 280w. Several bikers flew past me, stomping up the hill like their lives depended on it. I had to be really self controlled here and not give in to ego. In most Ironman races outside of kona, I’m usually the one doing most of the overtaking, and this time there were quite a few guys riding past me, fast. I managed to keep my composure and ride my own race, sticking to the plan I had trained to. After the hills, there were some long fast downhills, where I think I lost quite a bit of time due to riding like a chicken. There was one hill after Colleen Glen, where it’s pretty easy to get up to 45 mph / 70 kph, but the catch is that there are two speed bumps half way down! I took them at about 38 mph but there were guys flying past me over these things… kudos to them, I really need to grow a pair! Going all the way down you get to the farthest end of the bike course, with amazing views of the maitland sand dune and the Indian ocean. The scenery truly is spectacular! One more climb, followed by another fast downhill on rough road surface, and you get to to a long coastal stretch back home, on this day straight into a headwind (easterly wind, unusual for this time of year). It was a long grind, with great views, all the way back to transition and the start of lap 2. I knew I was on track for a slower time than expected, so any time goals were immediately discarded and I began to focus on the numbers that matter. 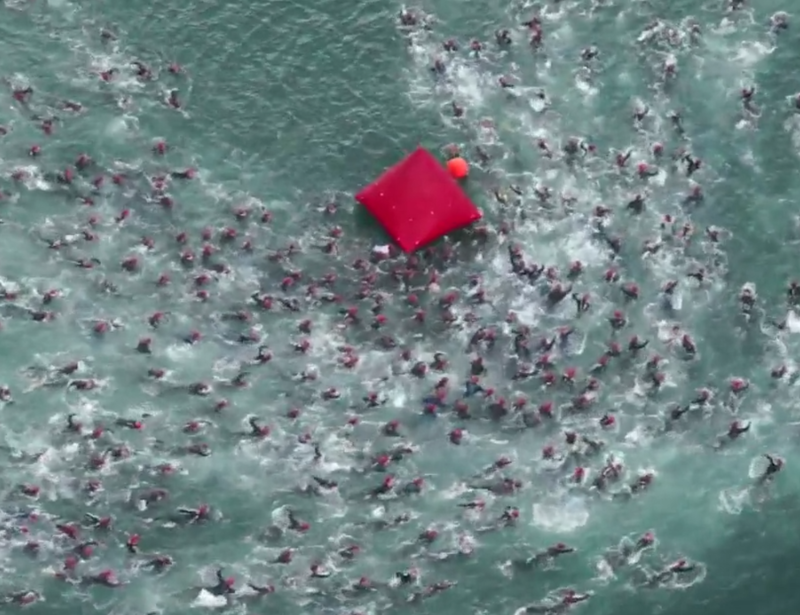 Ironman South Africa 2014 from Bigshot Media on Vimeo. It was time for a quick check on nutrition. I had already gone through 1500 calories in 2.5 hours, on the upper end of my intake range. Based on my metabolic testing I knew I was burning 800-900 carbs/hour at this pace, but only taking in 550-600. I could feel that I was at the max of my intake ability (slight feeling of “fullness”), so I decided to hold back for 40 minutes and only take in water. I also took a look at my TSS (if you don’t ride with a power meter, this won’t mean anything to you). In general I would aim for a TSS of around 300 for an IM bike split, maybe a little more because I’m able to take in a higher than average number of calories. However after lap 1 my TSS was reading 170, which was way more than it should have been. So in addition to backing off the nutrition for a bit, I decided to dial it back on the bike for a while. I focused on keeping RPE (perceived exertion) at around 4/10 creeping up to 5/10 on the hills, and I took every single opportunity to coast where I could, over 28 mph. The wind had picked up on lap 2, and I was even more cautious on the downhills. Guys would get about 60-70 seconds ahead of me on the downhills, but I kept on telling myself that I wouldn’t be able to run with a broken arm! It was a huge relief to get to the bottom of Maitland hill – I knew I’d get home in one piece from there without wiping out. The downhills were done, but I was faced with the final menace – 50km of riding into a heavy headwind. I focused on keeping my watts steady, I didn’t push too hard, and just tried to conserve as much energy as possible. My watts were still too high, but I was just doing what I needed to do in order to move forward! At this stage I wasn’t sure how I was placed, but I knew I was doing ok since I had passed a few pro men, and then rode past Natascha Badmann who was struggling with her small body into the wind. I focused on getting the last of my fuel in, with the marathon now within sight I had to be prepared and ready to run well. I knew I had biked a little too hard, and that I would be at risk of glycogen depletion on the run if I didn’t slow down and eat more. As we drew near to T2, I saw a few of the male pros on their first lap of the run. I didn’t see any age groupers, but I knew there will still some ahead of me. Despite riding easier, my TSS was still really high, now almost at 350. I knew that I’d need to start running on the conservative side in order to finish strong. 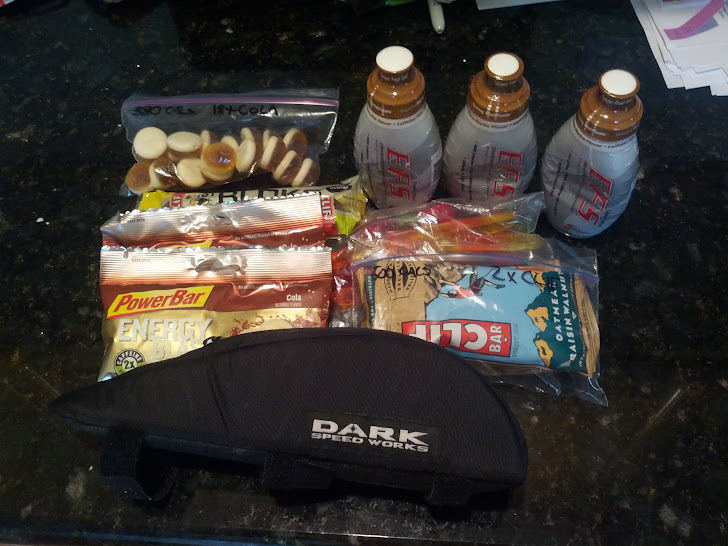 I entered T2, grabbed my run bag, put on my socks and shoes, grabbed my bottle (frozen coke), sunglasses, garmin and cap and headed out on the start of the marathon. I started off at what felt like a very easy pace. I was aiming for 7:15-7:30 / mile, so I was surprised when I glanced down at my garmin and saw 6:55 / mile. I knew this was too fast, so I eased up. When I looked down again I was at 6:40 / mile! I consciously just let it flow and ran as easily as I comfortably could, but I still went through mile 1 in 6:52. Miles 2 and 3 were similar with 7:03 and 7:10. After that there is a bit of uphill, and no spectators, through the “university section”. I did a few miles around 7:45 before settling in to my goal pace of 07:30. At this stage I was in 4th place, but I didn’t know. I knew I was in the top 6 (there were 6 slots) but I really had no idea what place I was. The crowd support was fantastic. It was great to see my mom and dad, Nikki, Ben, Caleb, and other friends Ron, Shara, Tam, Roy, Brian, Brendan, Neil, Louise and more! This is what it’s like racing on home turf! Halfway came by pretty quickly, then it was the next 5 miles that were a bit of a grind. 07:30 no longer felt easy, in fact 07:45 felt like hard work! I was trying to get more coke down but was just really sick of drinking. I allowed myself a few miles over 8:00/mile until I hit mile 18, when I started to dig deep. I told myself just get through the next few miles, and then you’ll just have 10K to go. I’ve done 10K hundreds of times. I told myself that I just needed to dig deep and imagine I was starting a 10K right then. That final sprint had me amped for hours. I had a quick massage before seeing my family in the finish area. They were over the moon with excitement and there was much celebration! We then went back to the sidelines to support Grant. He was still looking strong despite having some major GI issues. It was a special moment being able to greet him as he crossed the finishing line. Even though this is an individual sport, there is something incredibly unifying about having overcome the same tough day together, suffered through the pain, and reached the finish line. The next day we attended the rolldown, and I’ve got to say the IMSA organizers really made this a celebration. What usually is a rather dull formality was turned into a real high production event, with Andrew Messick, CEO of Ironman/WTC, handing out a lei on stage to all Kona qualifiers. I was super stoked to meet my online friend Matteo (who raced in my AG @ IM Los Cabos and see him realize his long time dream of getting that kona slot! Congrats Matteo! The awards banquet was superb. Great food, great atmosphere, and a super fun time! Overall I cannot say enough good things about this race. The organizers are a level above all other IM races I’ve done outside of Kona in terms of the level of professionalism and their attention to detail. The course is spectacular (although tough), and the PE locals are super friendly and welcoming. If you are looking for a great race to do, do this one! This was my 2nd year doing Oceanside. Having just come off a successful Ironman Los Cabos 2 weeks prior, I had no idea what shape I would be in. My plan was to swim hard (and see if my poor swim in Cabo was an anomaly or that my swimming has regressed), bike hard and then run whatever I could manage. The day before the race was a slight disaster. I flew into San Diego at midday, with ample time to get to Oceanside and register. Tribike Transport had shipped my bike directly from Cabo to San Diego, so I picked up my bike and then started my journey up to Oceanside. However the Friday traffic was insane and it took me over 1.5 hours just to get to Carlsbad. I first checked into the Sheraton so I could drop my bike off, and thought I’d just inflate my tires and take it for a quick spin. This is where things started to go wrong. My tire wouldn’t inflate, so I took off the valve extender, to deflate the tire first. It slipped as I pushed it, and fell through into my wheel. I tried everything I could to deflate the tire but nothing worked. I took it with me to registration, to see if the mechanics could deflate it, but they couldn’t either. Ok so it was time to trash a new $20 latex tube. A quick poke and it was deflated. We took the tire off and saw that the valve extender has actually fallen into the hollow area of the Zipp 808 wheel. It was just clanking around in there with no obvious way to get it out. The mechanics just laughed when they saw what had happened. nice… I spoke to the Zipp people and they said I should just ride with it – after all Zipps are designed to be pretty much indestructible they said! I continued the checking process, walking around with my clanking carbon wheel. I got my numbers and stuff and headed back to the hotel. It was way after 6 now, and I still had to test my bike out. I quickly replaced the tube, inflated both tires and headed out for a quick spin. 5 mins into the ride and whooooosh! puncture on the rear! $20 Latex tube #2 gone… time for lucky #3! This time it held up, but it was getting late so I kept my ride to a very short 5 mins and went to get the rest of my stuff ready. I quickly put all my numbers on my bike, helmet, race belt, and then got to the gear bag stickers. Ummmmm ok where are my gear bags? It seems that they didn’t give me any! A quick email out to my Triforce teammates confirmed that you actually had to go somewhere else to pick up the gear bags, which nobody told me. This was just bad on the organizers part – I’ve done a lot of races and I just take it for granted that my stuff is all going to be there. Anyway, it was after 8pm so nothing I could do about it now, so I settled in for my dinner of chicken, salad and rice, got my final things packed and turned in for an early night. I slept like a log, woke up at 3:30, an hour before my alarm but I was awake, so figured I’d just eat, get ready and go. It’s a very quick drive from the Sheraton to the race parking (about 10 mins) so I was there with plenty of time to spare. I picked up some extra gear bags, set up my run stuff in T2 and then rode my bike down to the swim start and T1 (about 10 mins ride). I quickly racked, got ready and then headed down to the start. The conditions were a lot better than 2012. The water was warmer and calmer, the weather in general was mild / warm, and I think the wind on the bike course was the same, or possibly a little windier. My swim went ok. 30 mins which was 4 mins faster than 2012, but the course was long last year (or at least I possibly swam it long). As you can see from my training peaks file, in 2012 I swam over 2300 yards at an average pace of just under 1:30/100y and in 2013 I swam 2100 yards in just over 1:30/100y. Maybe I get points for consistency, but I did put a lot of work into my swimming in 2012, and I had improved a lot by November, yet I seem to be back where I started now (poor swim in Cabo and in Oceanside). As an example, here is my file from Big Kahuna last September where I averaged 1:23/100y with less effort than yesterday at Oceanside. I need to figure this out, but at least I know what I really have to work on before Kona! Bike: The bike was good. I just rode hard the entire way. The sensible way to ride Oceanside is take it easier on the first half and keep some energy for the way back (hills and wind). However, I was in Ironman shape so figured 56 miles would be ok to go hard the whole way. I felt great for the whole bike. Run: The run started really well. I was feeling very comfortable and hitting out the miles at 6:30/mile which was on plan. I actually thought I would manage a bit faster than that, but was expecting the possibility of going slower. I held this pace for the first 5 miles, and then suddenly the wheels came off completely. I had fueled well, but my body was just very fatigued (lower back, hamstrings) and I could barely hold 08:30/mile. I just held it together (barely) to the end and came home in 1:35 for the run, 4 mins slower than 2012 but I’m in much better run form. I was hoping this wouldn’t happen, but for me 2 weeks is just too soon after an Ironman to give it a hard effort again. OverallI was happy with my day, obviously disappointed that I couldn’t man up enough on the run to bring it home, but happy to be done and now HAVE A BREAK for at least a few weeks! I was really happy to be there with a top bunch of guys from the Triforce team. 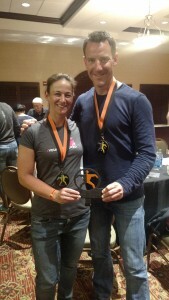 We really had a blast, winning the division 5 club category (small tri clubs) by over 11000 points! We naturally celebrated post-race in Triforce style with a speedo party in the hotel hot tub! This is the first time I’ve posted a separate nutriton report, mainly because I finally got it right! The most critical for me is getting the bike nutrition right, since you can’t take nutrition on the swim, and you just take in what you can on the run (I take only liquid calories in the form of coke and pepsi, maybe a gel if variation is needed). For my full race report click here. In the past I’ve only taken in around 400 cals/hour (mainly because I didn’t think I needed more than that). Through some initial (and quite experimental) metabolic testing I knew that if I was going to push hard on the bike, I’d need to take in over 500 cals, preferably more. So I lpanned my nutrition out, tested it several times on training rides and then in my Ironman rehearsal workout 3 weeks before race day. During my rehearsal, I managed to take in over 650 cals/hour but in cold conditions. I figured that around 550 would be ok in the heat. During the taper I ate lots of veggies, a high % of protein, but very little red meat and no processed carbs (the only carbs came from fruit and veggies). From the Thursday I started eating a higher % of carbs, mainly rice & oatmeal, no gluten or fiber. I think the no gluten paid off well, even though I have no official gluten issues, it seems to make it easier on my GI system to process other foods. Friday: HUGE bowl of oatmeal with whey protein, some eaten at breakfast and some at lunch. Rice and tuna mid afternoon, and a light dinner of rice and vegetables. Saturday: Pancakes for breakfast, rice and veggies for lunch, light dinner of rice and vegetables. Some rice bars during the day, and a bowl of oatmeal just before bed. Race morning: “race day rice pudding”: 1 cup white rice mixed with 1 x EFS liquid shot kona mocha flavor. Overall I was very happy with my nutrition. I took in a lot of calories on the bike with no gastric distress, and I got through the whole race with zero toilet stops (first time ever). 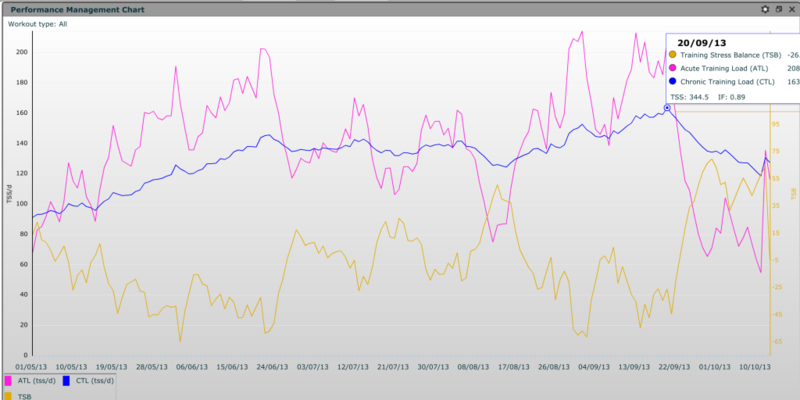 Next step is to get this right for Kona, which means taking a similar approach but practicing it a lot in hot weather. Los Cabos was almost as hot as Kona but not as humid which makes a big difference.